Every year, a different town or region constructs the nativity scene (presepio) in the Piazza outside St. Peter’s Basilica and it is usually designed to reflect some aspect of the region. 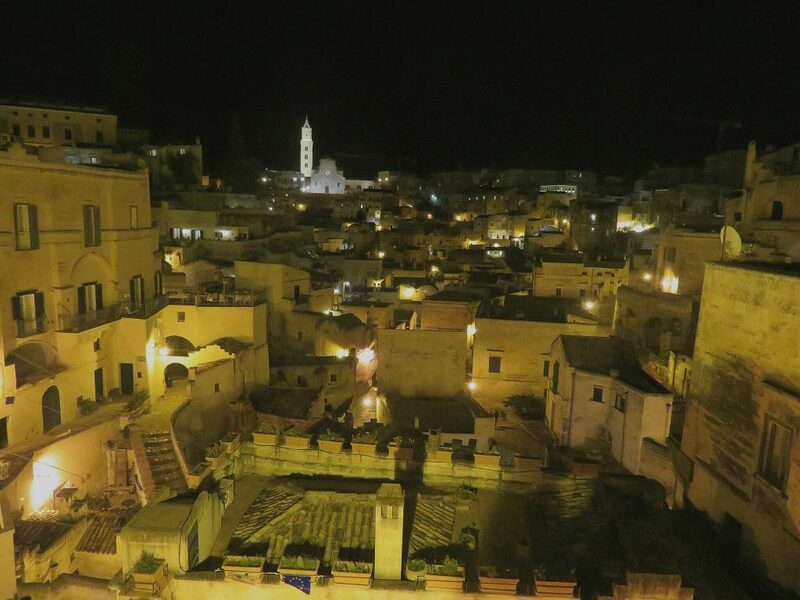 A few years ago, the city of Matera, which is between Naples and Bari, made the Presepio featuring the town as a backdrop. It was so beautiful that ever since then, I have been wanting to visit it. When my sister and brother-in-law were here, I persuaded them to join me on a trip there. 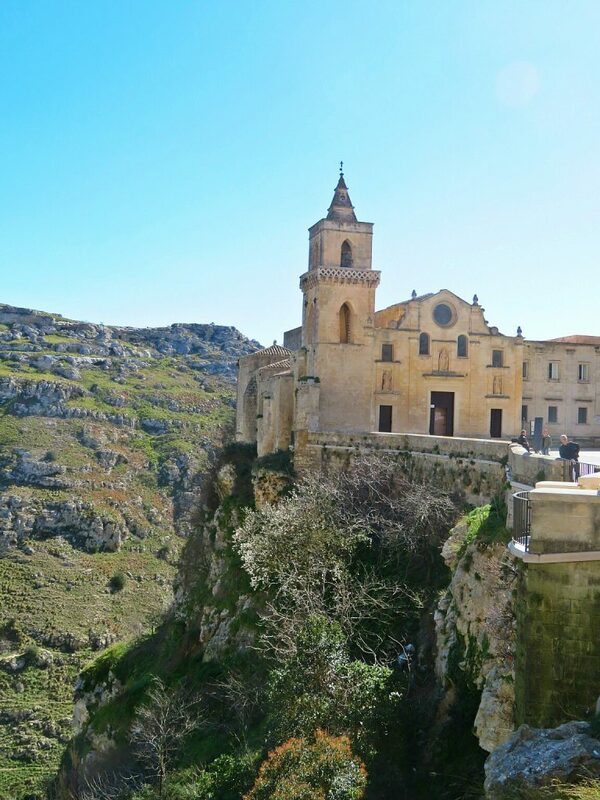 Matera was designated a UNESCO World Heritage site in 1993 and and voted the European Capital of Culture for 2019. Dating back to Paleolithic times, it is perched on the edge of a deep ravine. 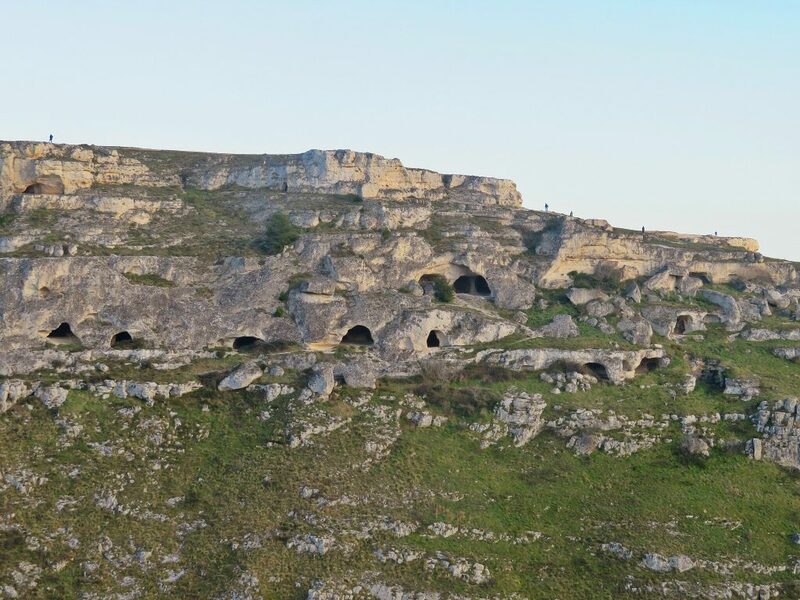 The caves and dwellings on the hillside, occupy two areas called Sassi, the upper Sasso Barisano and the lower Sasso Caveoso. The original dwellings were scooped out of the rock. 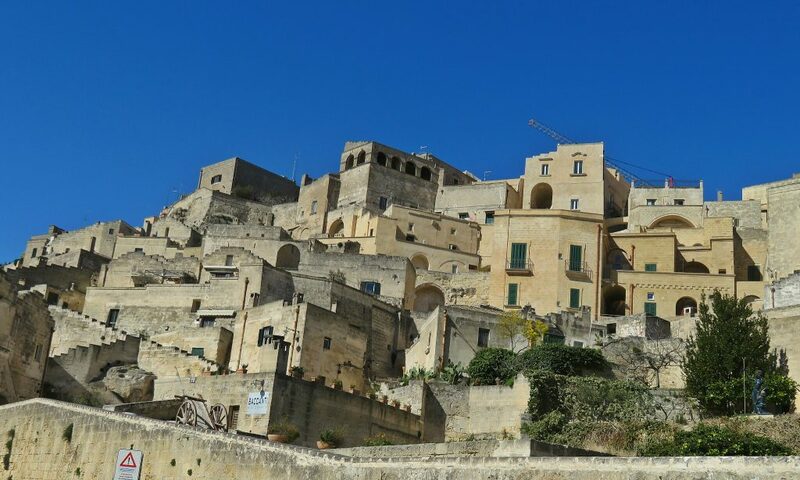 Over the years houses were built on top of the caves and now there seem to be houses on top of houses which looks quaint until you try to get to one of them and have to climb numerous steep and winding stairs. 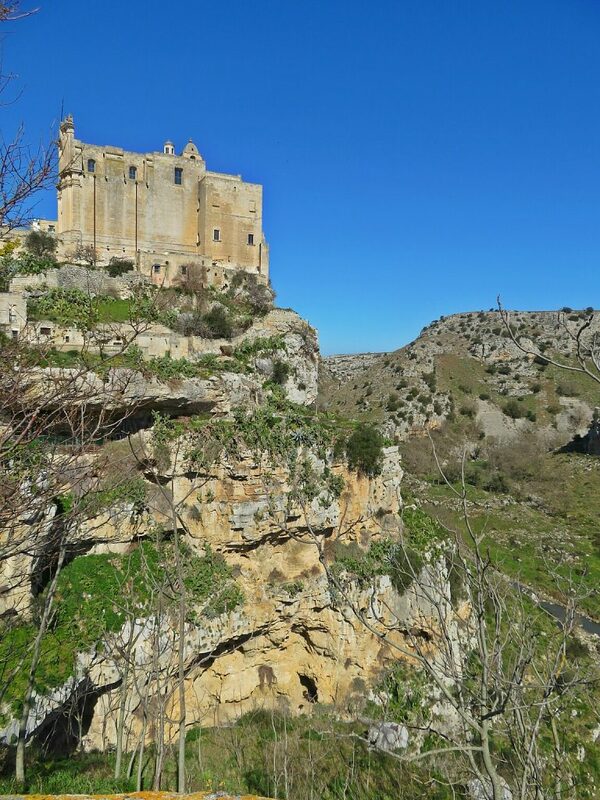 Across the ravine which is now a National Park, Parco della Murgia, you see caves dotting the hillside. Some used to be dwellings and many were churches since it was a refuge for monks from the Byzantine Empire from the 8th to 13th centuries. The park is full of wild life. 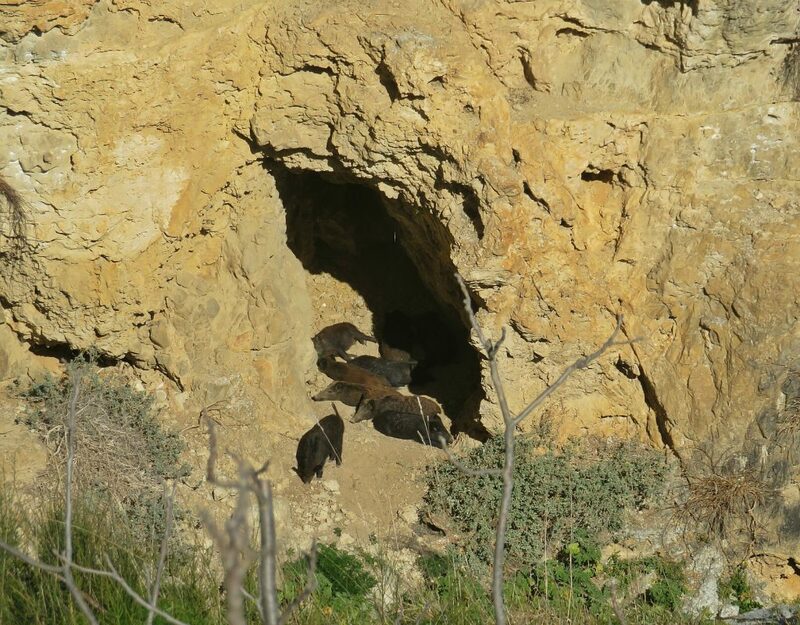 As we were walking along the road on the edge of the town, we looked over and saw wild boar who had taken up residence in one of the caves and were sitting at the mouth enjoying the sun. In the town, churches carved out of the rock (Rupestrian churches) abound. Newer churches have been built on top of a few of them precariously clinging to the edge of the hillside. 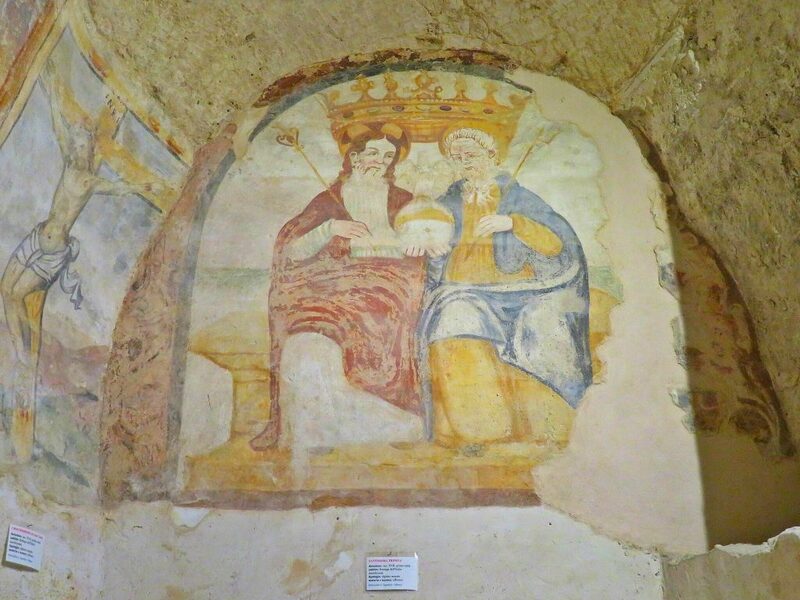 Inside the Rupestrian churches, there are Byzantine frescoes many of which have unfortunately faded and fallen into disrepair despite attempts to preserve them. Walking around the Sassi felt like being in Biblical times. 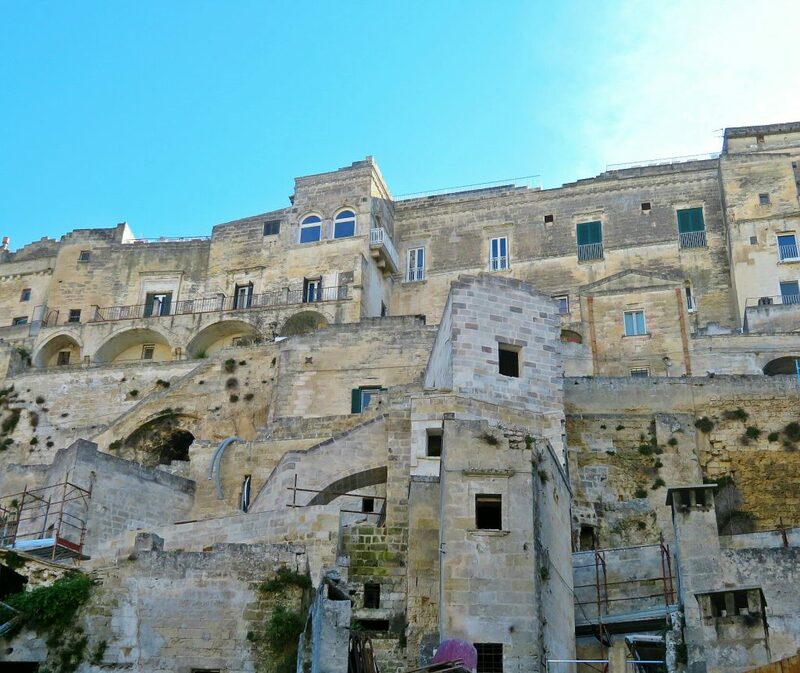 Matera went through many sieges and colonizations and suffered a long period of extreme poverty which was written about by Carlo Levi in the book ‘Christ Stopped at Eboli’ (Eboli is a nearby town). People were crammed together in the caves often with sheep and other animals in the same space. Life was hard. 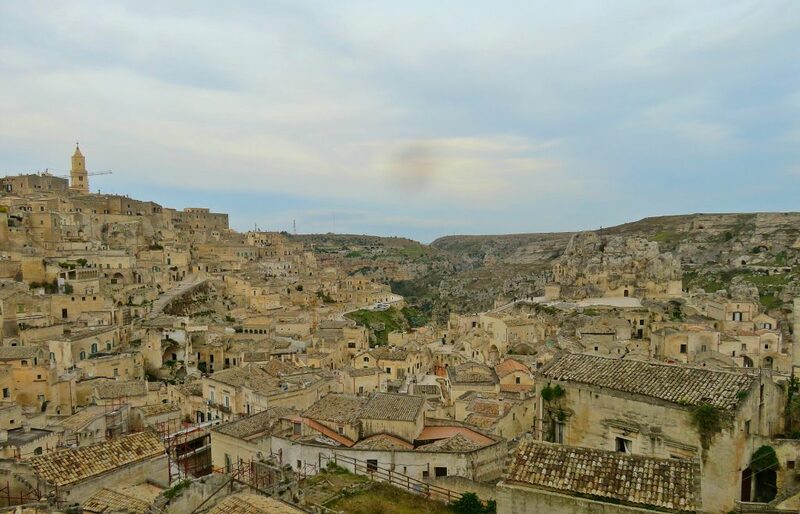 In the 1950s, the government tried to remedy the situation by building apartment blocks close by and rehousing the people in these so there is also the new town of Matera. The Sassi themselves have become a bit of a tourist showcase though people still come to gather in the larger piazzas. It was the day before Lent when we were there and lots of people with little children all dressed up in costumes gathered in one of the larger Piazzas to listen to music. 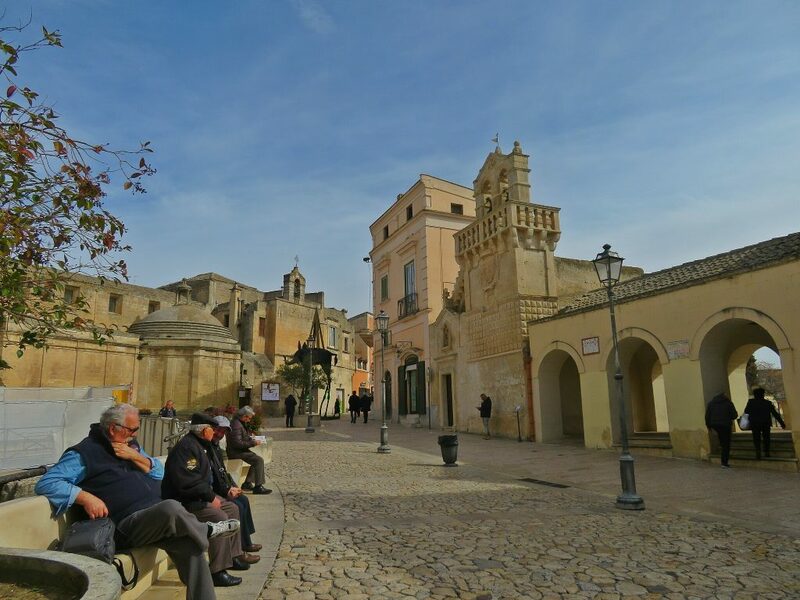 However, the next day, it was only the older men who came to the Piazza. I guess the women were at home either fasting or cooking. 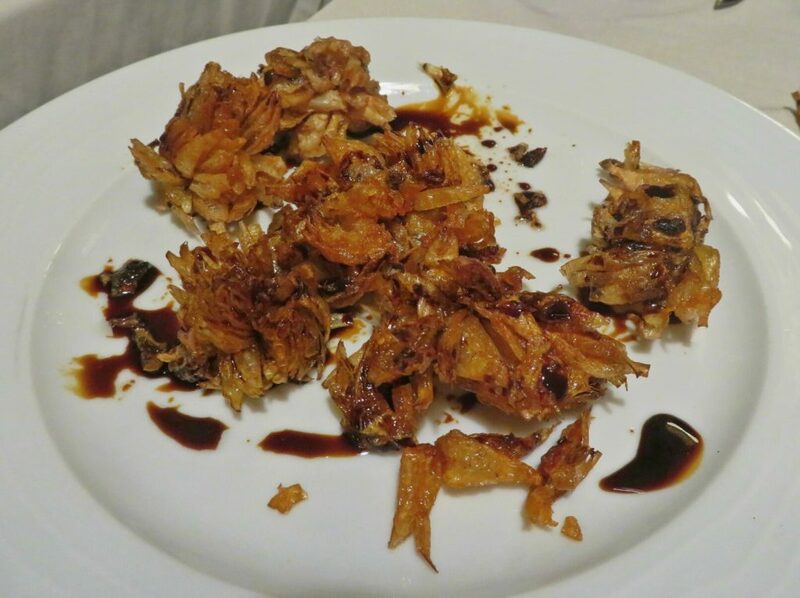 We tried some of the regional foods including a type of wild onion called lampascioni which, being a seasonal onion, used to be associated with lent. 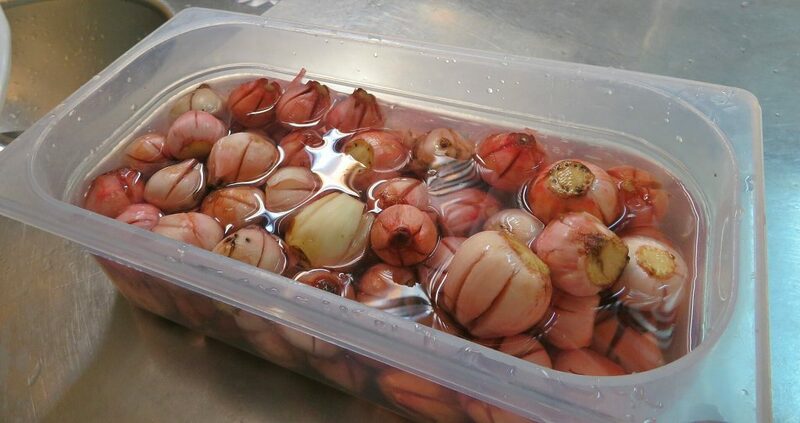 It didn’t look or taste like an onion but was interesting to try. 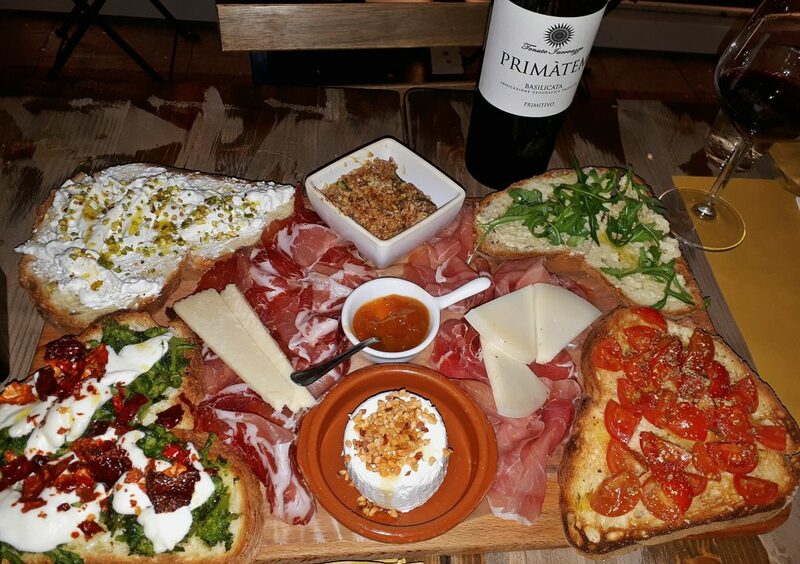 The local wines, Aglianico and Primitivo, were good and we had no trouble tasting them with a tagliere, basically a tray of cured meats, local cheeses and other nibbles. There was no need for dinner after one of these. 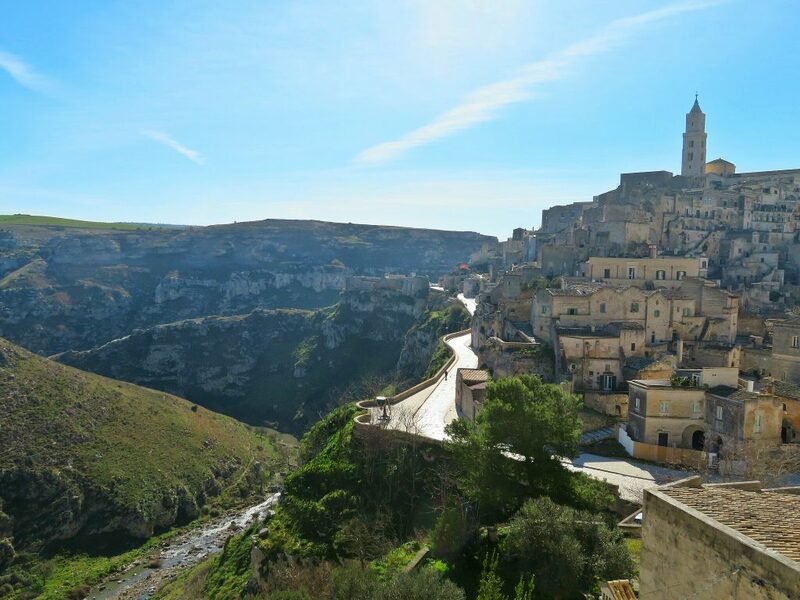 I was glad to have had an opportunity to see Matera and I hope its designation as a cultural capital for this year brings money to the city without it becoming even more of a tourist showcase. 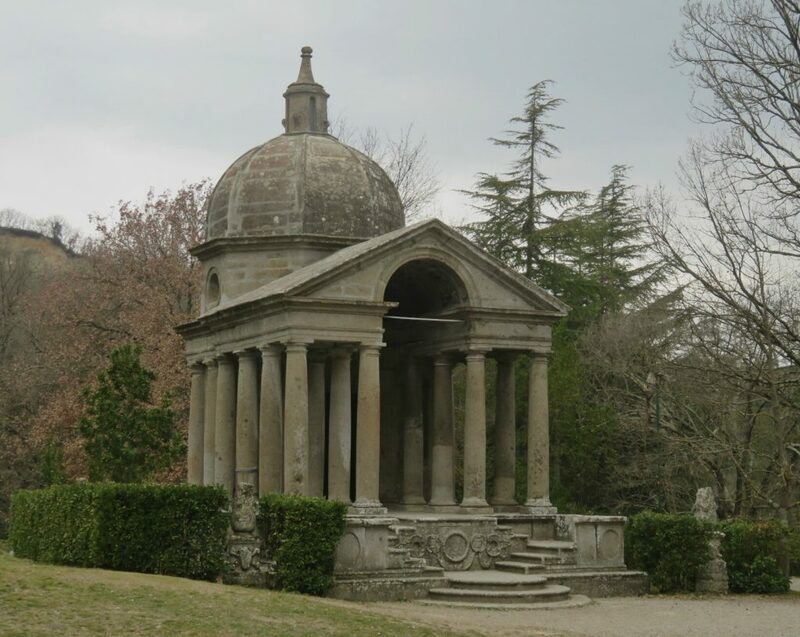 After visiting Bomarzo, we still had a good chunk of the afternoon so we decided to visit the Villa Farnese at Caprarola which is not too far from Bomarzo. 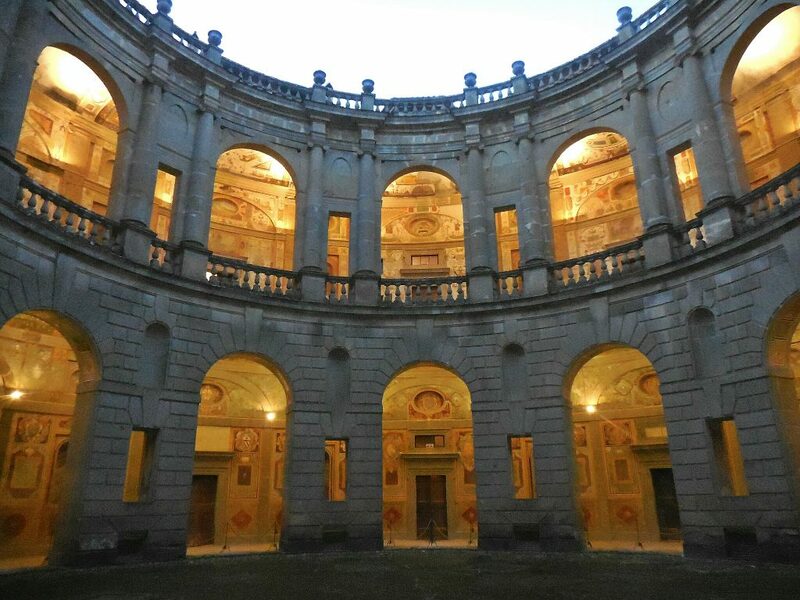 The Farnese family who were landowners in this part of the country had an important and complicated history. 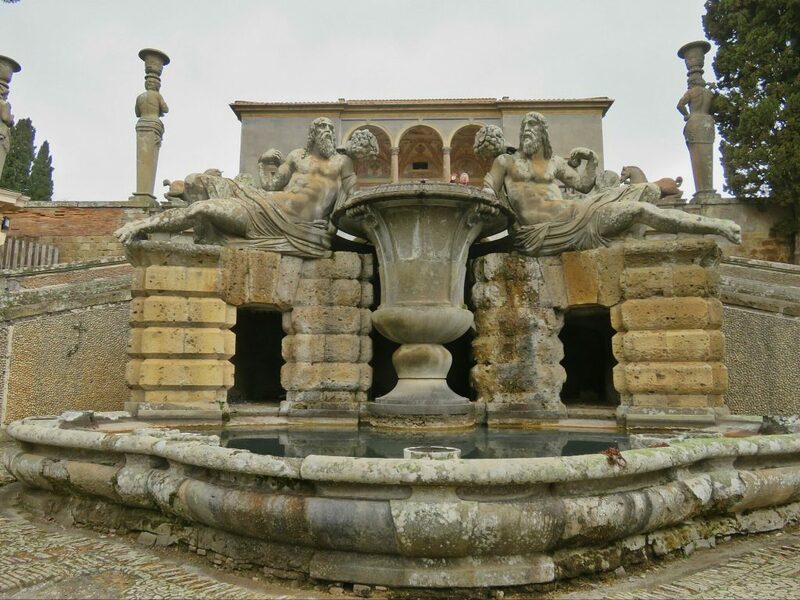 At the risk of being boring, I’m going to give you a short summary as I was quite confused by the number of Farnese palaces so I read about the family. 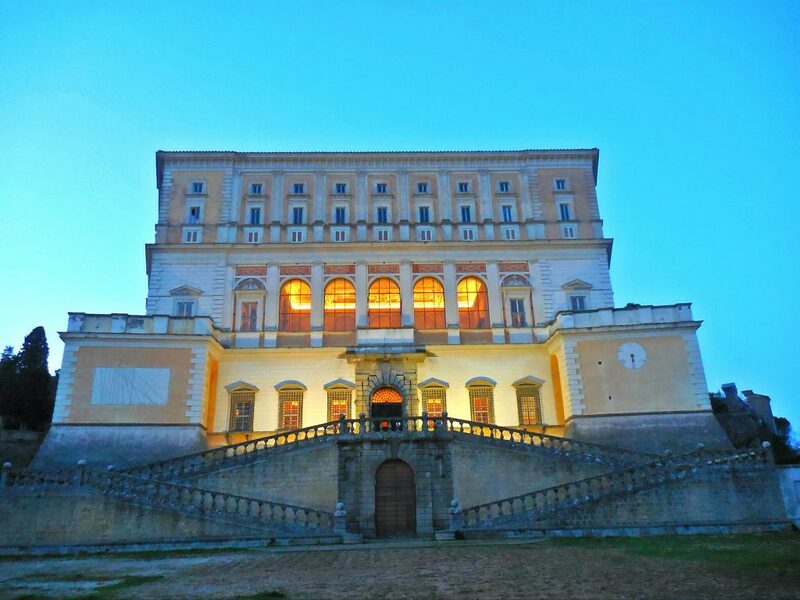 The Farnese were originally soldiers and landowners but gained recognition and status when in the 14th century, they fought for the papal states, were gifted land by the popes of the time and married into noble Roman families. Giulia Farnese, noted for her beauty and known as Giulia La Bella became the lover of Pope Alexander VI, Roderigo Borgia, who was appointed Pope in 1492. She persuaded him to favour her brother Alessandro who was subsequently appointed as Cardinal-Deacon at the age of 25 by Pope Alexander VI even though he hadn’t yet been consecrated as a priest. Understandably, he became referred to as ‘the petticoat cardinal’. Although he did become a priest and was pious, he had a Roman mistress from a noble family with whom he fathered four children. Highly capable and with wide artistic and philosophic tastes, he became powerful and rich building the noted Palazzo Farnese in Rome. 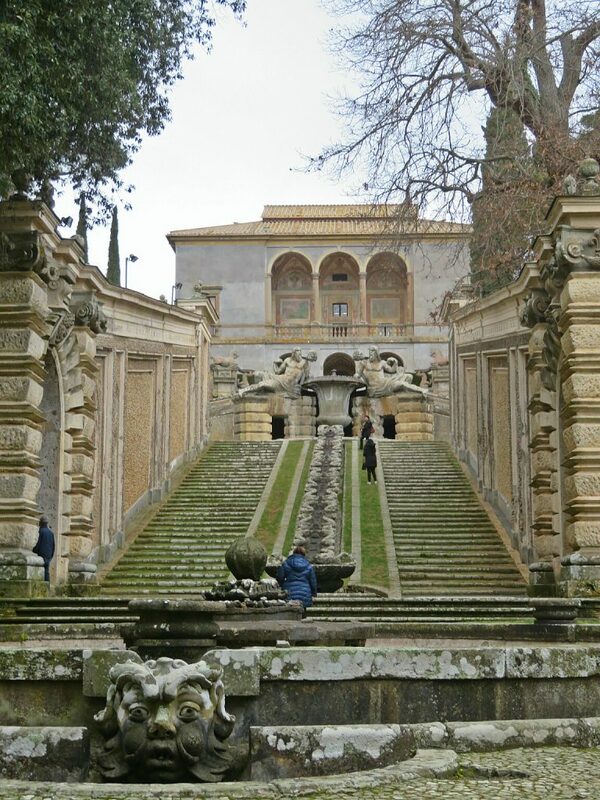 It was he who started building the Villa Farnese at Caprarola but building was stopped when he became Pope (Paul III) in 1534. He had a successful reign, bringing in various reforms to the church during the Counter Reformation, instituting the Council of Trent, and achieving many positive things in the church. However, he favoured his family and it is to him that we owe the word ‘nepotism’. The word ‘nipote’ in Italian can mean nephew, niece or grandchild. Pope Paul appointed two of his grandsons as cardinals, one of them also called Alessandro who was only 14 years old at the time. 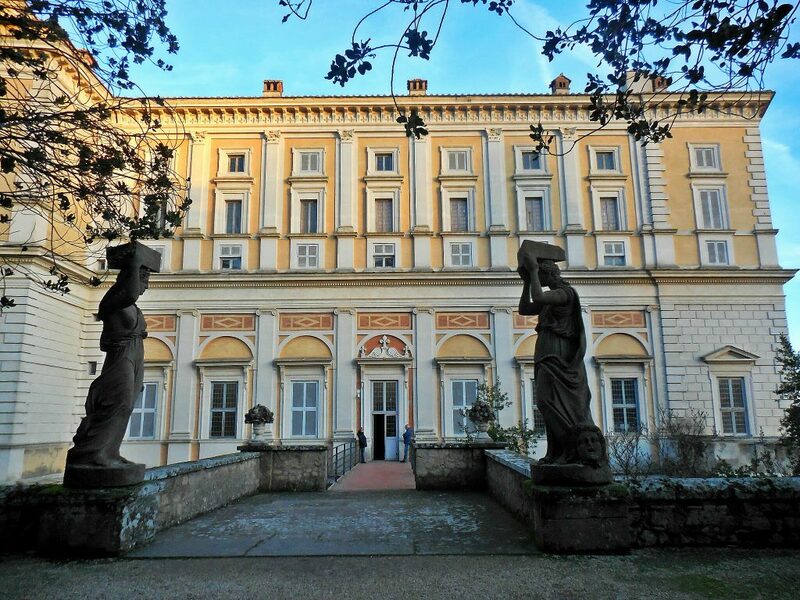 It was Alessandro the younger, a man of great culture and a patron of the arts, who commissioned the architect Vignola to complete the Villa at Caprarola in 1559. The villa has a pentagonal shape with a circular courtyard in the centre and a wide stair case on one side (wide enough to accomodate a horse) going up five floors. The photos below are just a taste as the frescoes were truly spectacular even though the light was poor by the time we saw them. Click on the link for more pictures and a detailed layout of the castle. 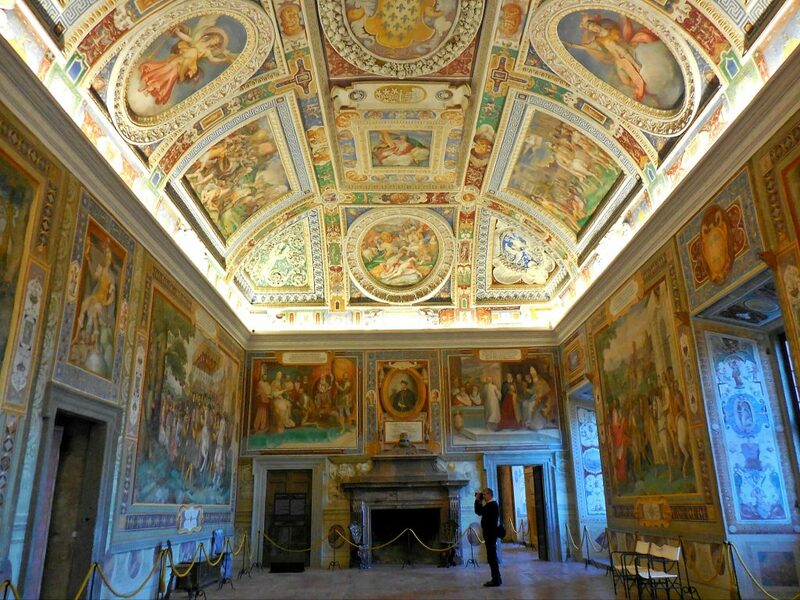 The piano nobile or main floor has large frescoed rooms. Above this are the winter apartments facing west decorated with contemplative scenes and the summer apartments facing east focused on scenes of an active life. Both the summer and winter apartments lead to a large Rennaisance garden which unfortunately wasn’t at it’s best at this time of year. One crosses a bridge over a moat to go into the garden. 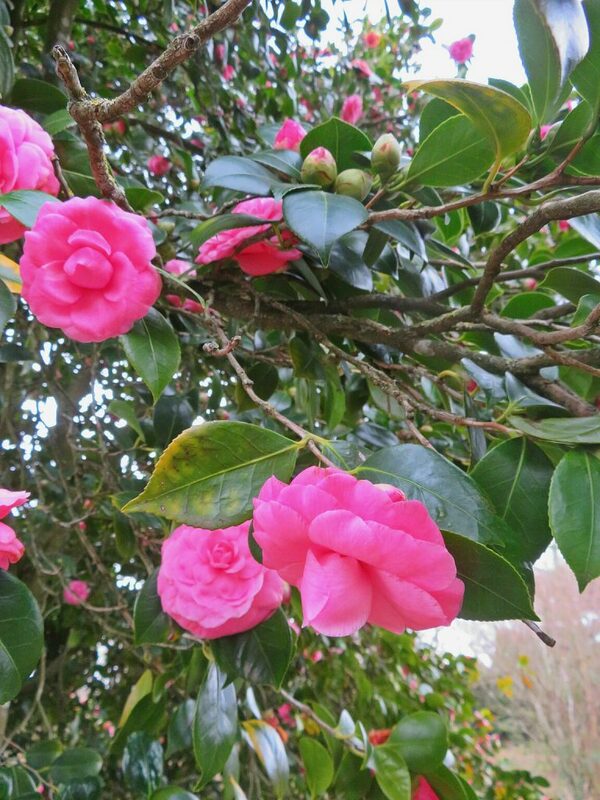 Unfortunately, the only plants in flower were a few camellias. On exiting from the formal garden, one goes through a wood at the end of which is a grand surprise. A beautiful summerhouse with two loggia for dining. 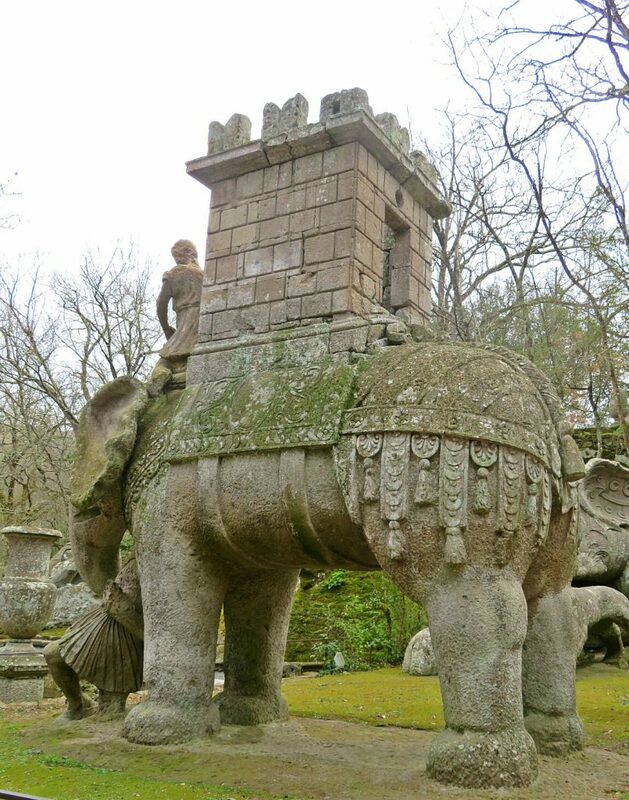 Perched on top of a small rise, the approach is lined with cascading fountains and statuary. As you can see, the fountains had not yet been turned on. 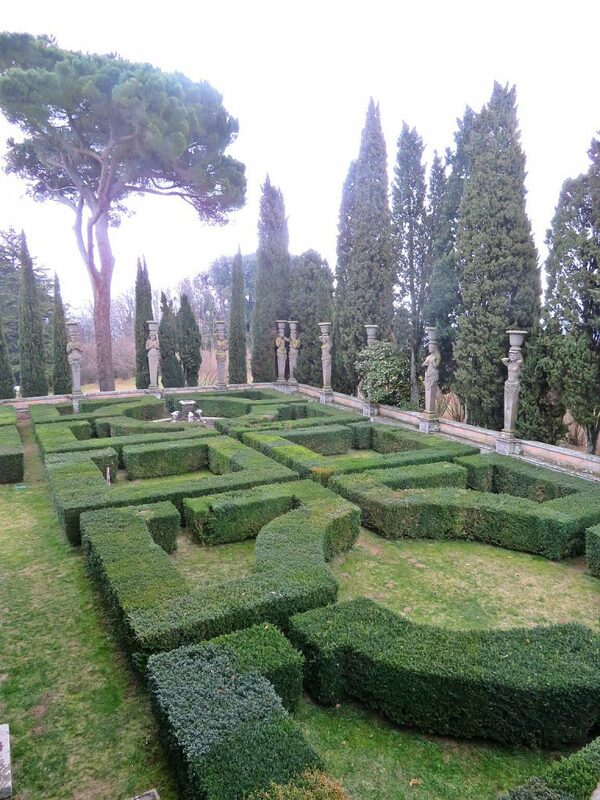 The garden must be spectacular a little later in the year and I will have to visit the villa again early in the summer to see them at their best. Our adventure for that day finished with dinner in a restaurant close to where I live but there were more trips to come which I shall tell you about in my next post. My sister and brother-in-law, who are keen gardeners, came to visit me in the last two weeks. 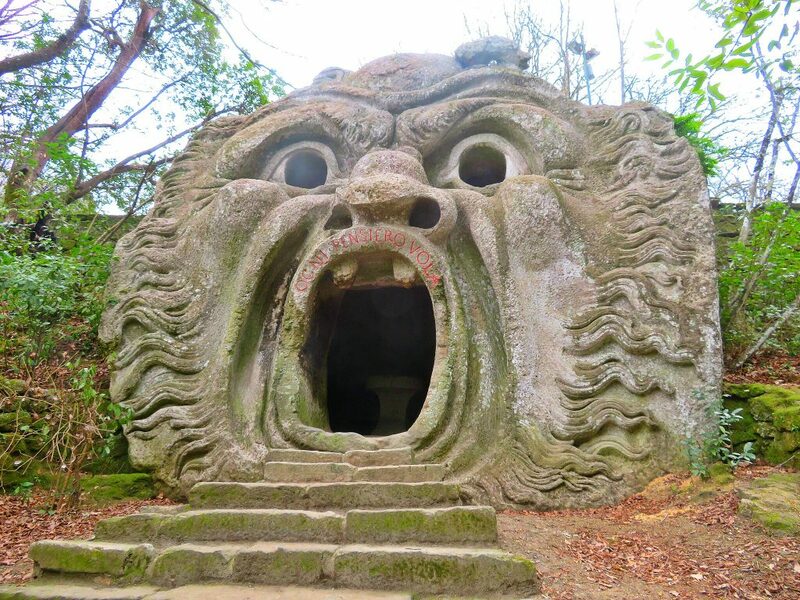 They have been to Rome several times and were interested in seeing some of the gardens outside Rome, their first choice being Bomarzo Parco dei Mostri (Park of the Monsters). 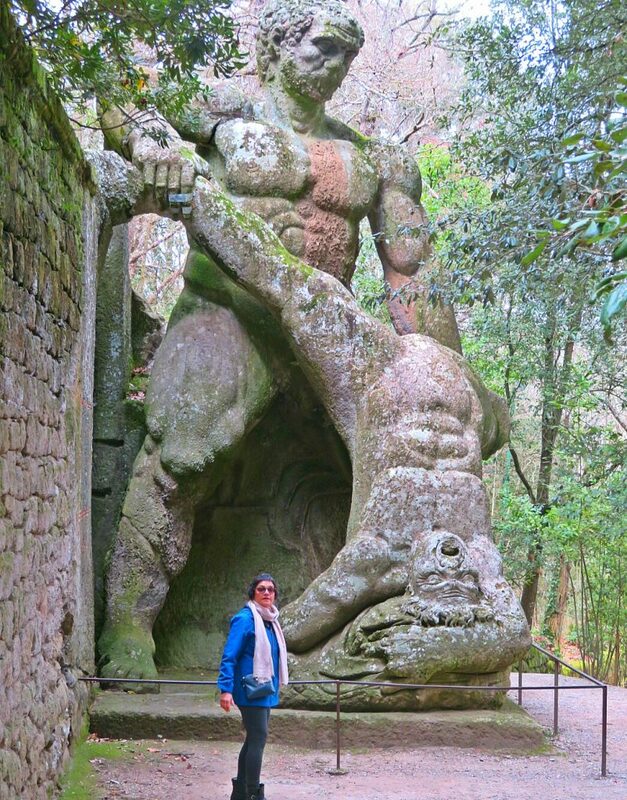 This is a weird and unusual garden filled with giant rocks carved into unusual and sometimes scary statues. 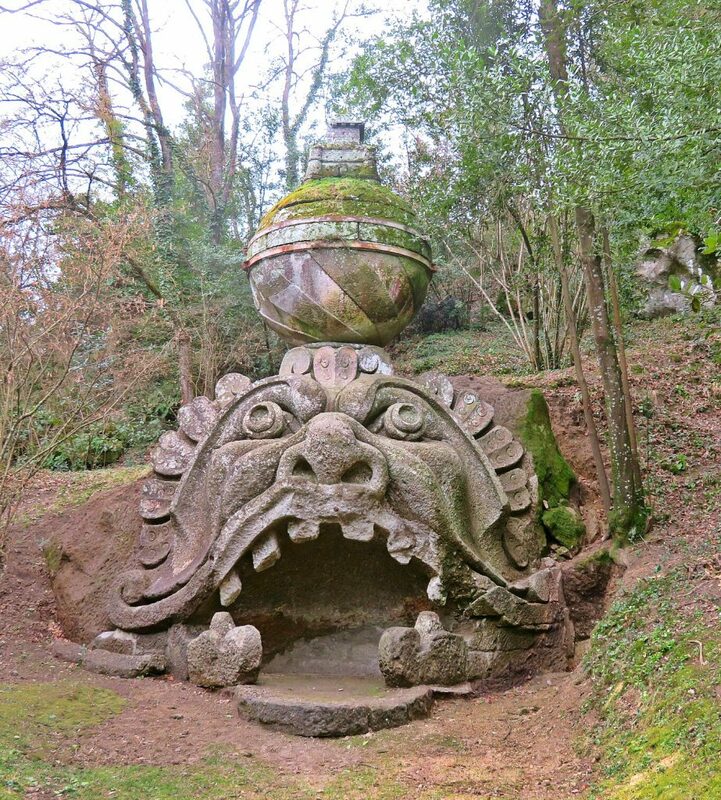 The garden was commissioned by Prince Pier Francesco Orsini in 1552 whose castle is in the adjoining medieval town of Bomarzo. This became a passion of his after the death of his young wife Giulia Farnese (not the lover of Pope Alessandro VI, Roderigo Borgia, but a relative). Built in the Mannerist style which is to say a sort of 16th century Surrealism, it is not designed to please but to astonish. 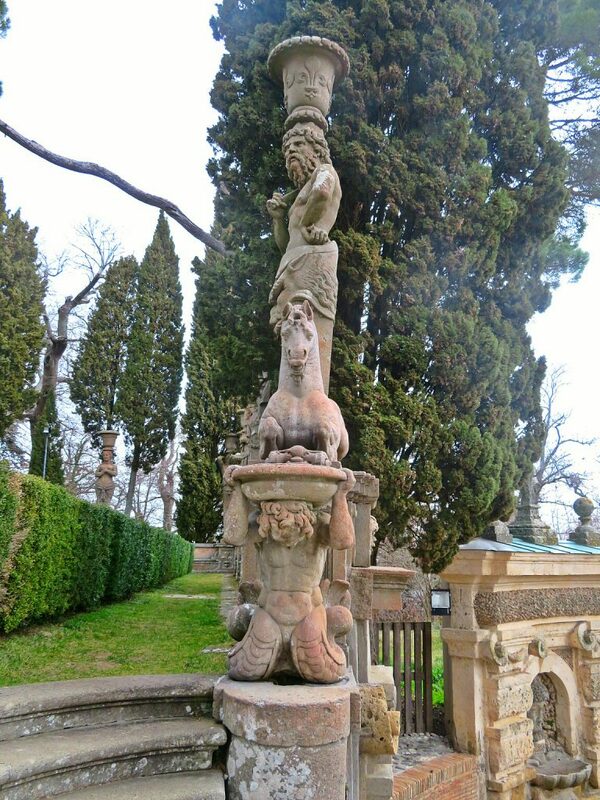 It was designed by Pirro Ligorio who also designed the gardens of the Villa D’Este at Tivoli. 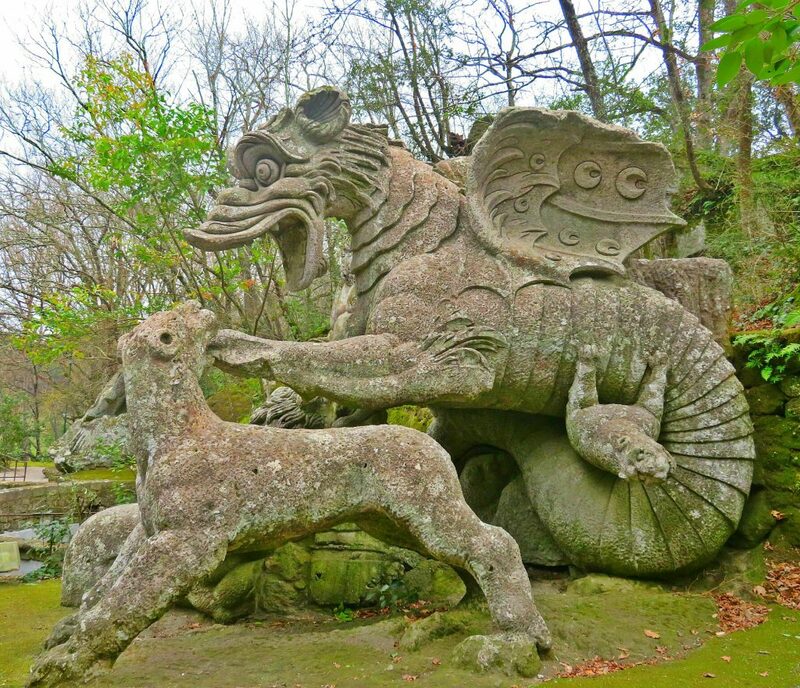 The statues are of monsters and mythical figures many with enigmatic captions written on them. 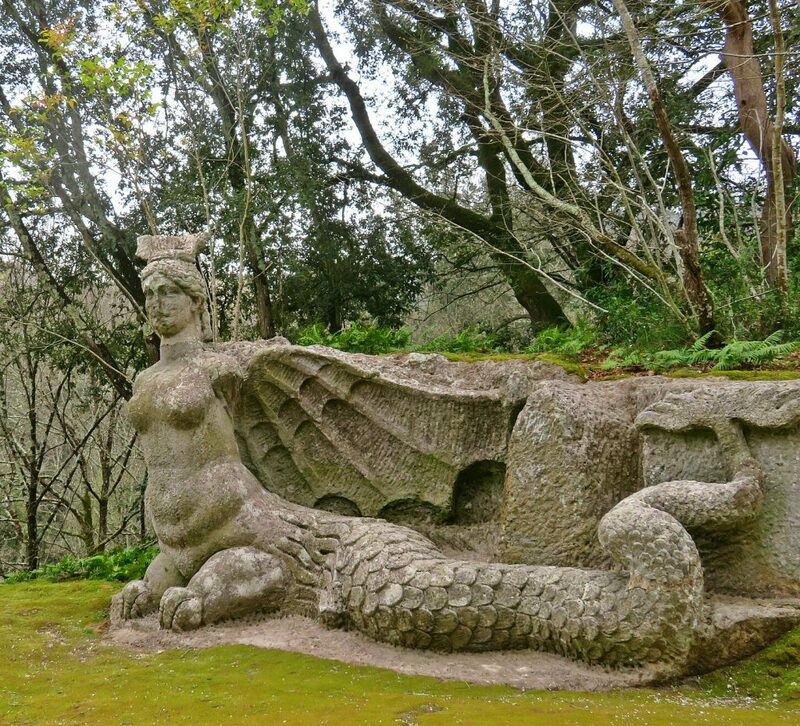 Salvador Dali and Jean Cocteau amongst others found the statues fascinating and the gardens have been featured in movies and referred to in poems. Inside the Orcus above, there is a small stone table at which one could sit and have lunch. Supposedly, a whisper in this space can be heard on the steps. I didn’t know that when we were there so couldn’t check it out. There is a small leaning house at one end of the garden which makes you feel quite dizzy when you go into it. Hard to know why the prince would have wanted such a thing as it is two stories high with several rooms all on an incline so you feel like you are going to fall. 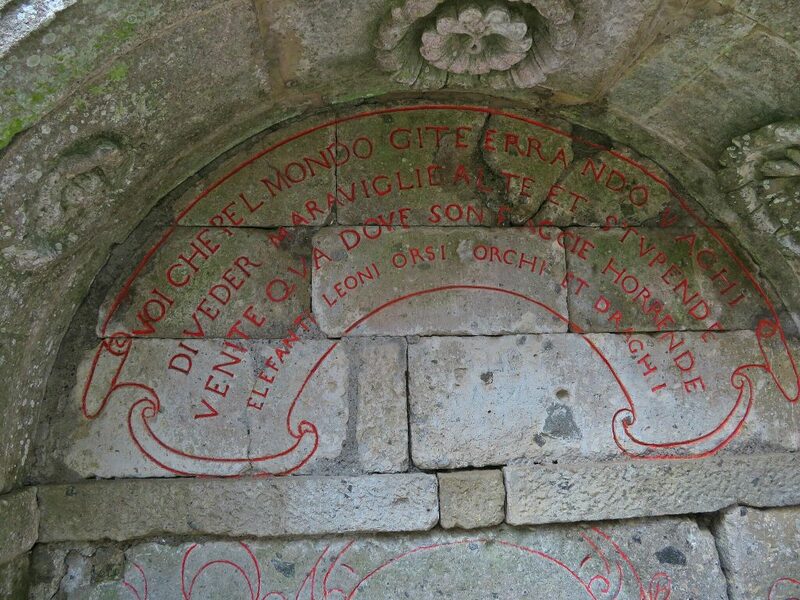 At one of the spots close to the beginning of the garden is a small bench with an large inscription on the wall behind it which you can read below. I was so busy trying to decipher the text that I forgot to take a picture of the whole area but the text sort of gives an insight into the mind of the Prince. He was a ‘condottiere’ a warlord/mercenary who made his fortune travelling with various armies. Perhaps following the death of his best friend in a war, and then the sudden death of his wife soon after, he had no desire to travel but wanted his garden to reflect the diversity of the world. elefanti, leoni, orsi, orchi e draghi. You who travel the world to see its wonders, come here where you will find horrible faces, elephants, lions, bears, ogres and dragons. I guess the prince must have come to terms with the grief for his wife as after about 20 years he had a beautiful temple constructed in her memory. 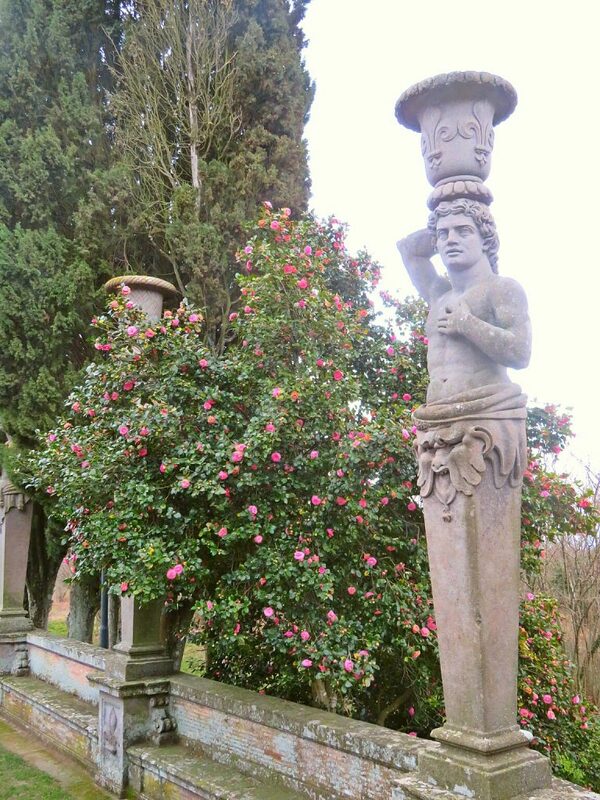 The garden fell into disrepair and was left abandoned until the 1950s when Angelica and Giovanni Bettini restored it. The temple was closed when we went there but we could see photographs of the Bettinis in niches in the wall so perhaps their remains have been placed there. This was not the end of our adventure that day, but more about that in another post. 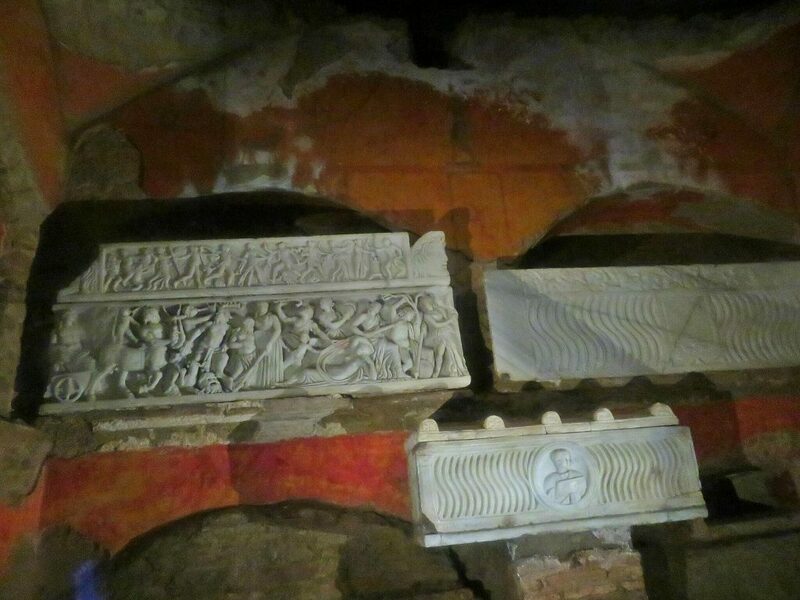 I was very fortunate last week to be invited on a guided tour to see the necropolis under St. Peter’s Basilica. A friend of mine had a special invitation from her bank to join a private tour and she invited me to accompany her. 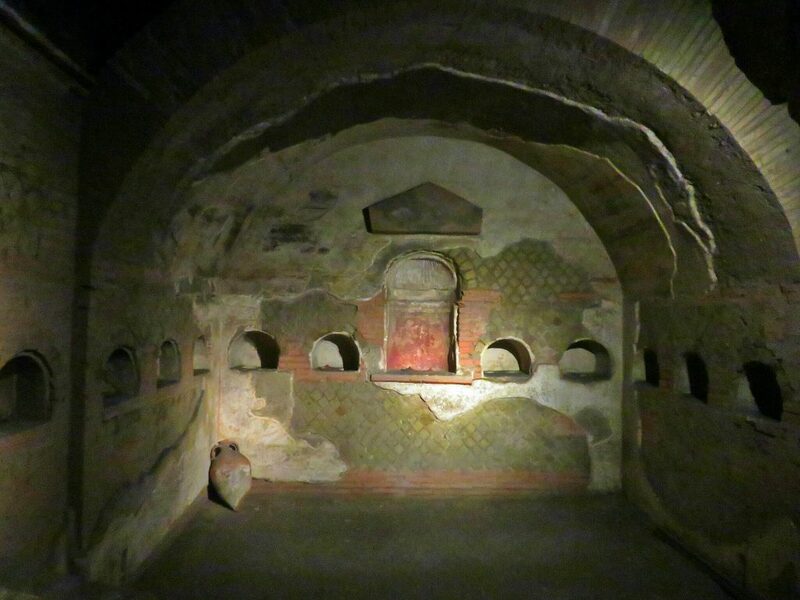 I had always wanted to visit the necropolis underground as I knew that it was vast and not only contained the remains of St. Peter but had once been a burial ground and cemetery for both Christians and pagans. At one time, it was forbidden to bury bodies within the walls of the city and the Vatican is just outside the walls so it was a convenient location. We started our tour inside the basilica. The dome of St. Peter’s Basilica is in my opinion, the most beautiful part of the structure. Just under the dome is the Baldacchino built by Bernini. Sadly, the four bronze columns were made from the bronze stripped from inside the Pantheon. It is monumental with a height akin to a seven storey building and occupies a very special spot as it stands directly above the tomb of St. Peter. We were told a lot about the monuments and decoration within the basilica. Even though I have been inside the basilica several times, I found out things that I had no idea about. 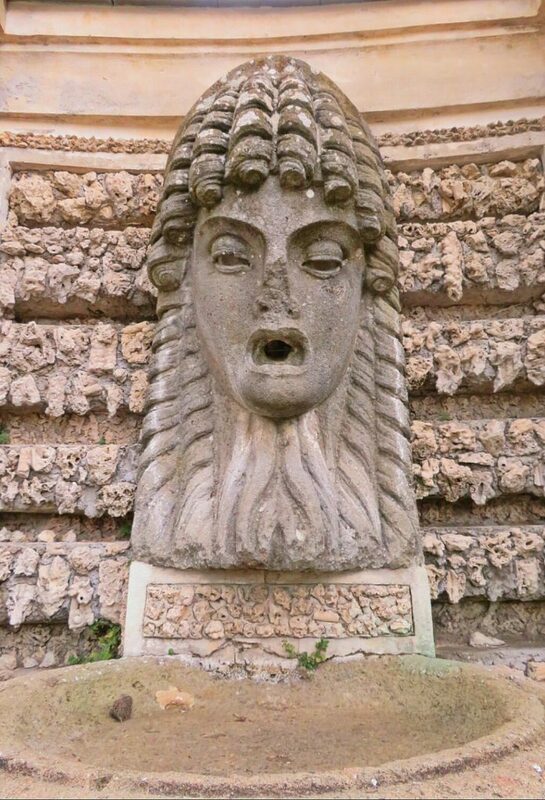 Our guide explained that during Roman times, the area around St. Peter’s was a hill called Monte Vaticano. It was countryside and the Emperor Caligula and his mother Agrippina had villas there. 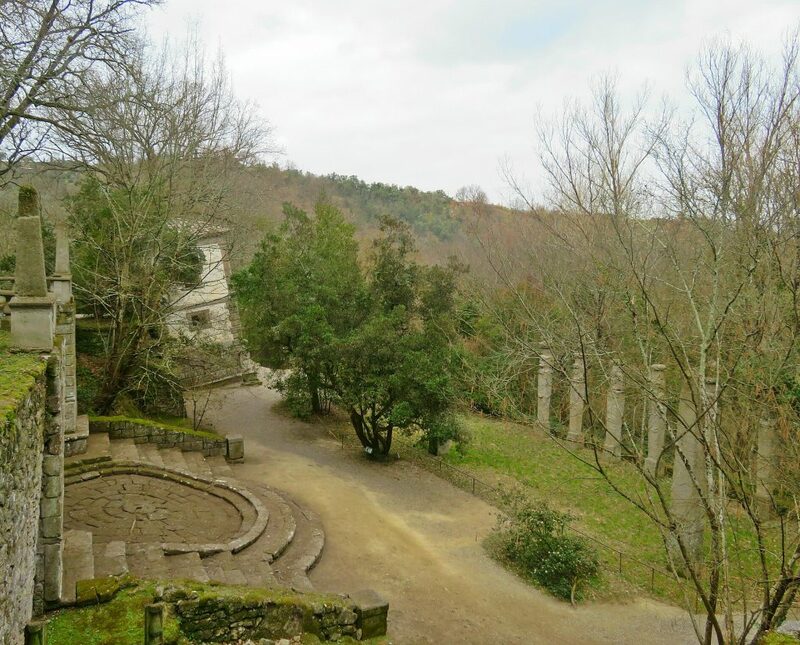 Nero had his race track (Circo) there as well. The Egyptian obelisk which now stands in the Piazza in front of the basilica, was once in the Circo Nero. Subsequently, after the decline of the Roman Empire, it became a burial ground first for early Christians and Peter was crucified and buried on the site. In the 3rd century AD, the Emperor Constantine legalized christianity and decided to build a church above the remains of St. Peter. 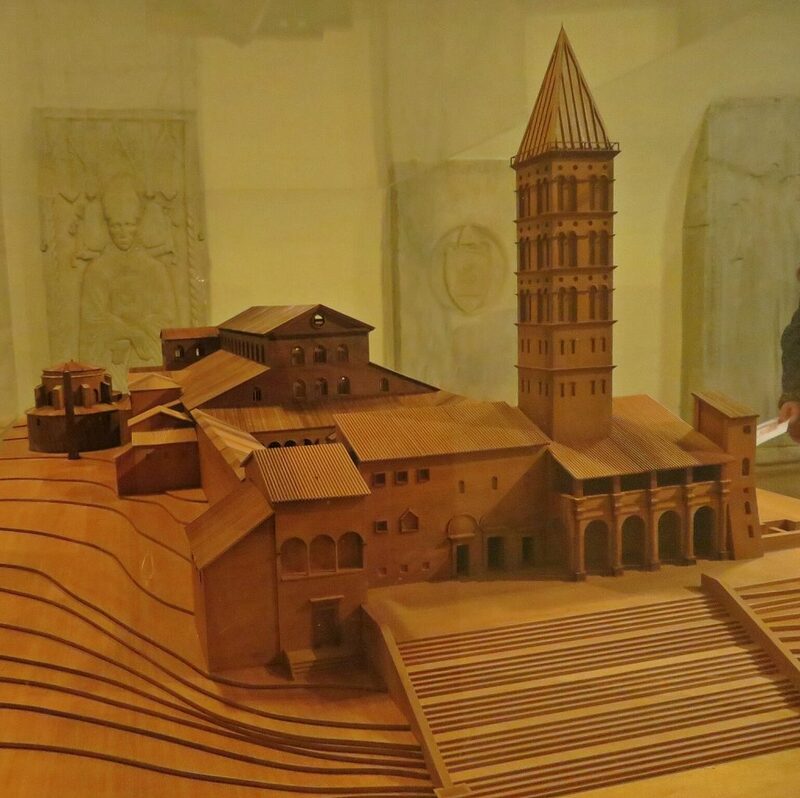 Our next stop was a small museum at the side of the basilica where we were shown a model of the original church which had a large cloister in front just behind the tower and a small church at the back where the altar was placed above the reputed remains of St. Peter. Since it was a hill and in order to create a flat surface for the church, earth was moved from the back to the front thus covering the cemetery and burial grounds. 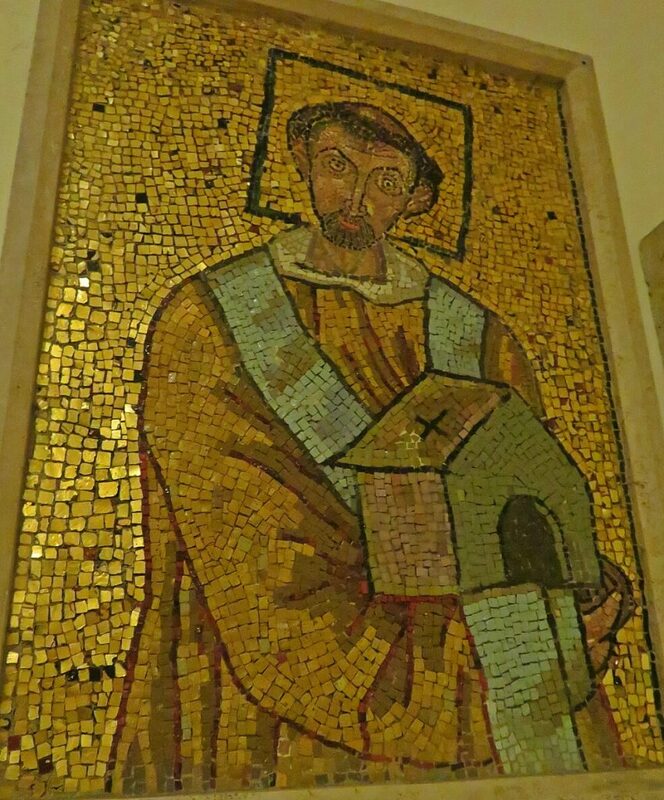 There were various artifacts from the original church, carved stone slabs, columns and beautiful mosaics including the one showing the Emperor Constantine with the church in his hands. 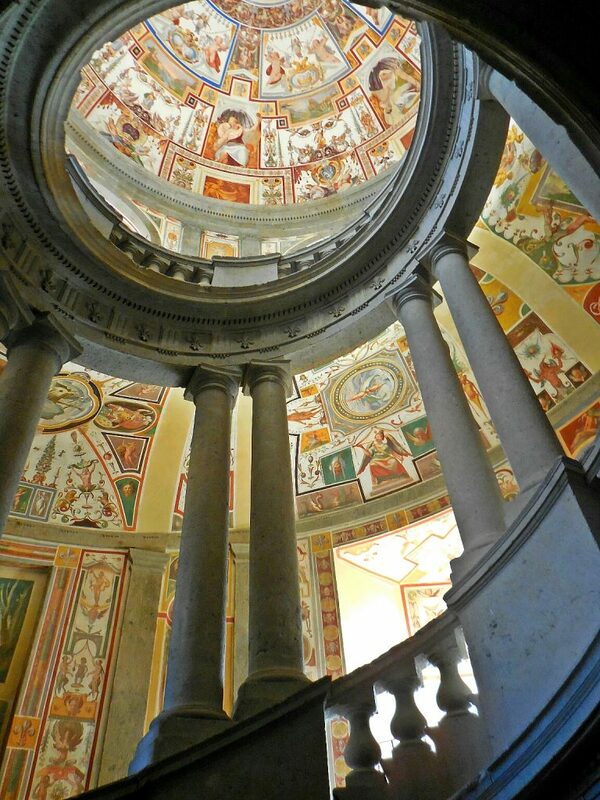 Next we returned to the Baldacchino and went down the steps leading to the space below. 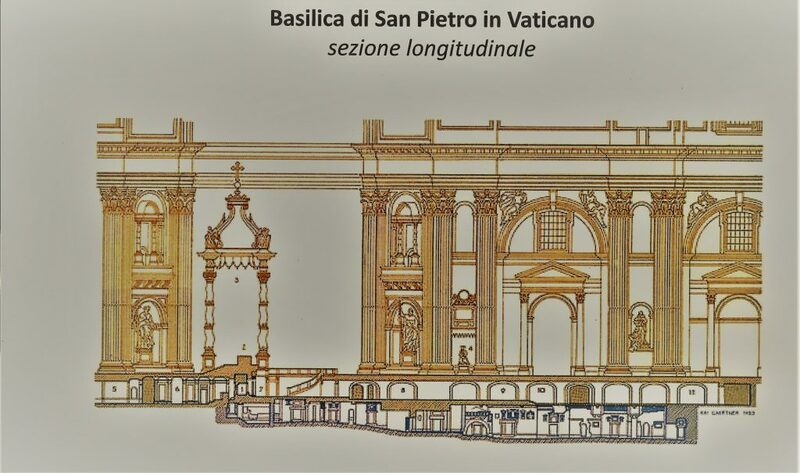 Underneath the floor of the basilica are two levels as you can see in the drawing below. The one immediately under contains the tombs of the various Popes but below that again is where the original cemetery and burial ground was situated. This area is lined with sarcophagi and rooms with burial niches. Only the rich could afford to have a room with niches for the whole extended family. Each room has a small staircase where the family would come and sit, on the day of the dead, and have a meal with their departed family. 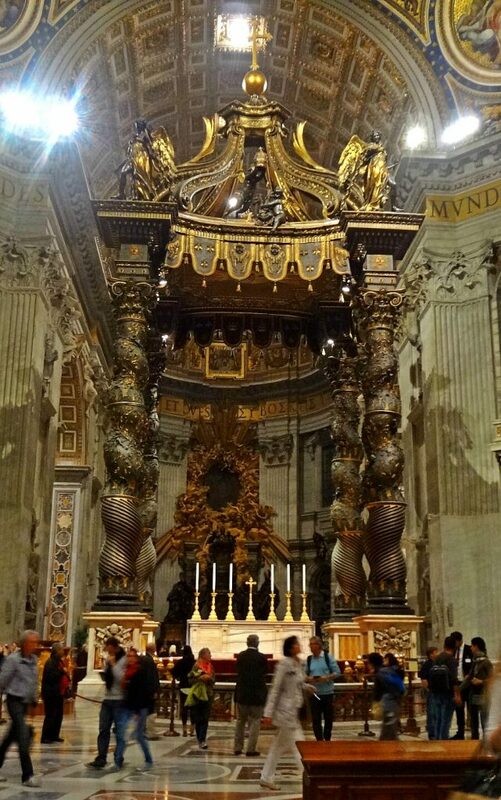 According to belief, the remains of St. Peter were just wrapped in a shroud and buried. The Emperor Constantine had a marble tomb constructed and the remains were moved into it. 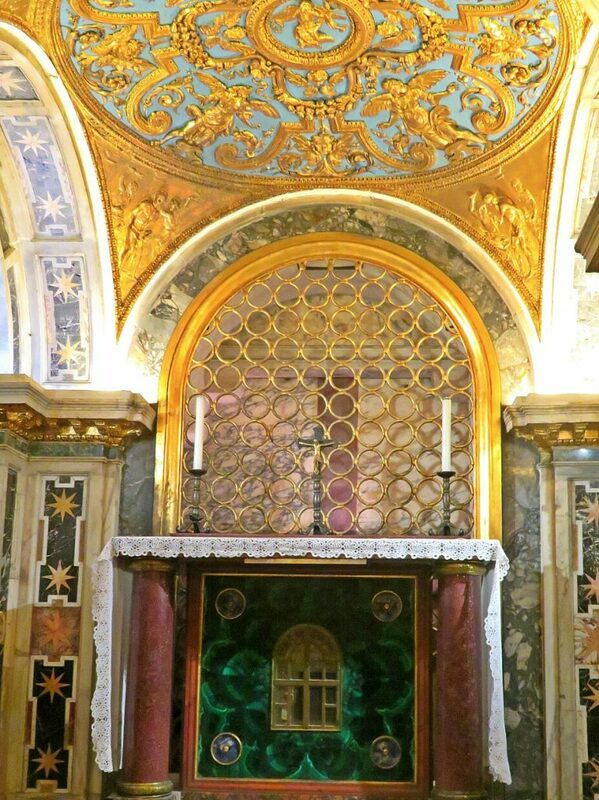 This tomb is what lies below the present Baldacchino and the one in the original church. A small sumptious chapel has been built next to the tomb which is now behind a golden screen as you can see in the photo at the top. The altar below has a panel of the most beautiful bright green marble I have ever seen. Apparently, an analysis was carried out on the remains within the tomb and they are consistent with a sturdy man in his 60s which is around the age St. Peter would have been when he was crucified. Incidentally, he was crucified upside down as he didn’t feel worthy to be crucified as Christ was. The tour took over two hours as we had a very knowledgeable guide who gave us loads of information. By the time we were done, we were hungry and needed refreshment. 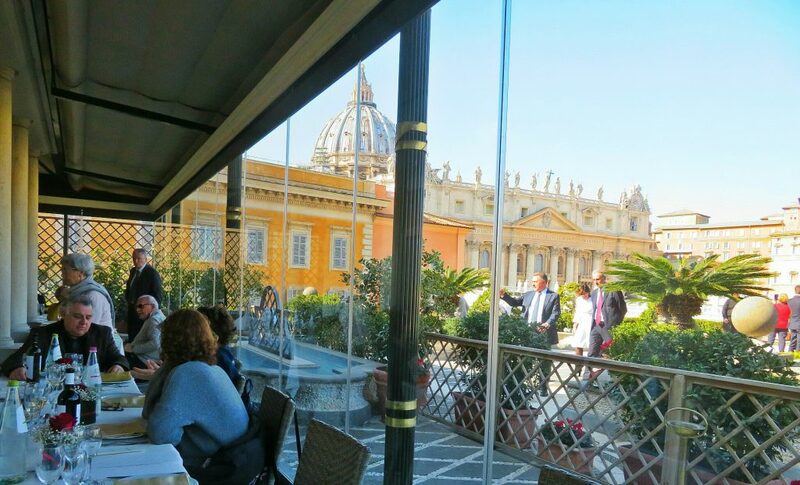 This event had been organized by a private bank and in appropriate style, they took us to a residence next to St. Peter’s where there was a beautiful terrace and dining room overlooking the Bernini statues surrounding the Piazza with the dome of St. Peter’s in the background. We started out with drinks and appetizers on the terrace, it was a lovely sunny day. Then there was a three course lunch with wine. It was an amazing experience and I can’t believe I had the good fortune to be invited on this tour. Thank you Nicoletta. 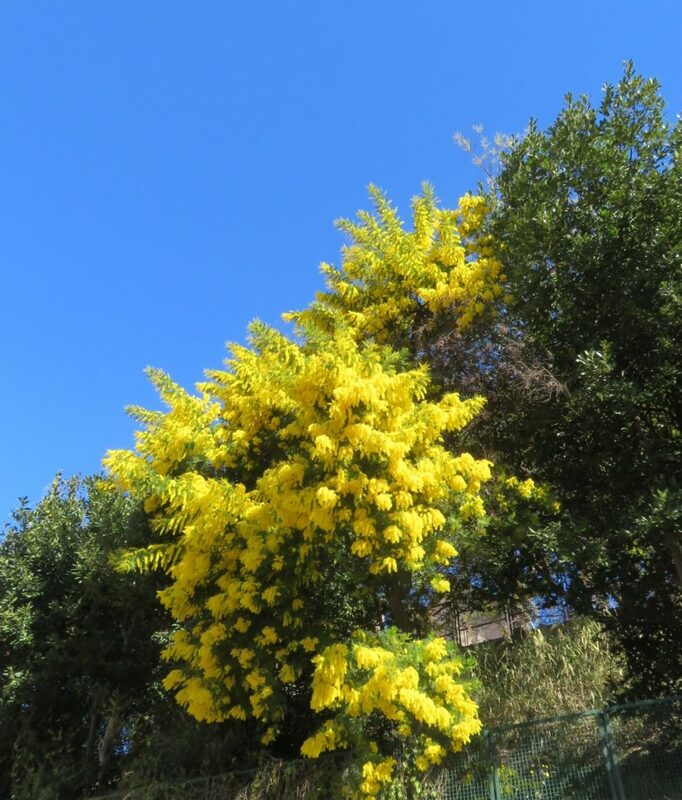 I know I have featured the above flowering mimosa in previous years but Icouldnt resist another picture. January was a wet and horrible month here. It rained almost every day without fail which is unusual in Rome. It does rain in the winter but usually for a day or two and then the sun comes out. Last week, it stopped raining, the sun came out and this wonderful sight is to be seen on the way to the market. It uplifts my spirits everytime I see it and it`s worth the slight detour. Life continues on in what might seem a mundane way except that I find it all interesting for the most part. I am teaching English in a small office which is part of an international network whose official language of communication is English. The needs and abilities of my students are all different and I do individual lessons but I don`t have a syllabus to cover and exams to set so it`s quite laid back. Once a week I go to my flute lesson. Its a long journey and takes up a whole afternoon but I like my teacher so I don`t mind. I have to take the train from where I live to an area called Ostiense where I catch another train. There is a pyramid in Ostiense which was built in 12BC by a Roman nobleman called Caius Cestius. It was the fashion for things Egyptian at that time on account of Mark Anthony`s involvement with Cleopatra. 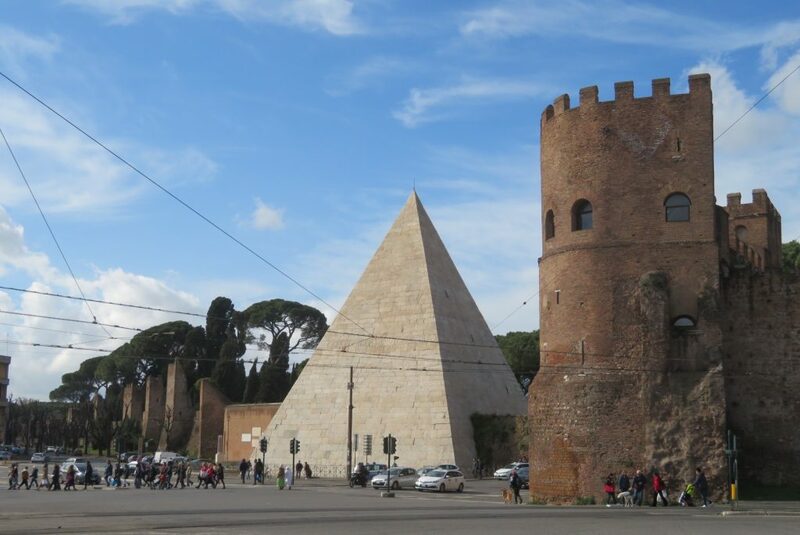 The pyramid is incorporated into the Aurelian walls so you see the fortifications alongside. It rises up between the walls and never fails to amaze me by its presence. My teacher, Alessandra, lives on the coast just beyond Ostia. She lives in an apartment on the top of her building and has a large terrace outside her music room. As I struggle to get a decent sound out of my flute, we see the ocean and little birds hopping around outside. 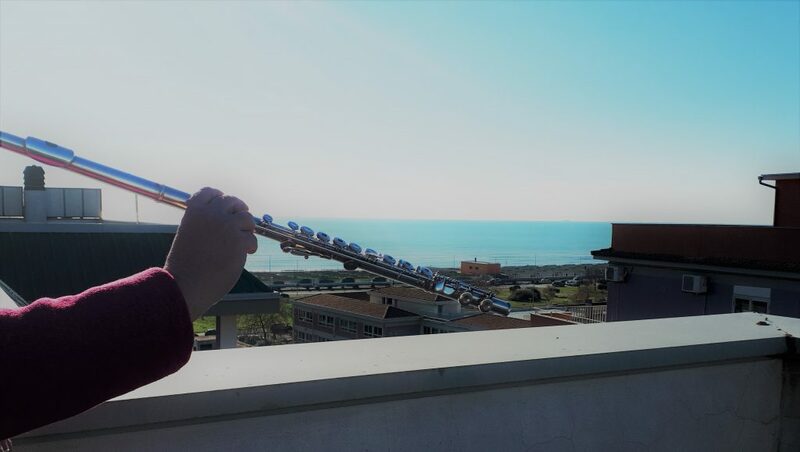 Last week, I persuaded Alessandra to hold the flute while I took a picture as it was a lovely day and I thought of putting in a picture in my next post. I had to promise not to show her in person as she was worried about not being properly attired! She is a professional musician who plays in several orchestras in Rome and just gives a few lessons on the side to supplement her income. Life is hard for musicians in Italy as there are no positions that offer any security. I am very lucky to have her as a teacher and I think she just took me on as a favour to her friend, a singing teacher who sings in my choir. I got my job teaching English through another choir member who was looking for an English teacher to teach in her husband`s office. Life works in strange ways. I arrived back in Rome yesterday to mild temperatures, about 10C today. Quite a change from Toronto where it was -10C when I left. I was meeting a friend for lunch on the other side of St. Peter`s Piazza from where I live so I had to cross the Piazza whereupon I came across an unusual sight. 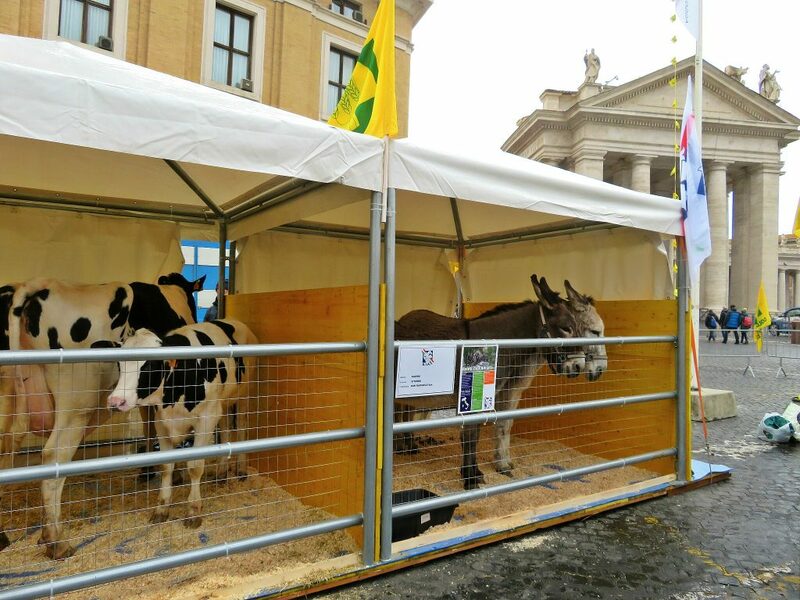 To my amazement, here were farm animals in cages in front of the Piazza. There were cows, sheep, horses, pigs, goats, chickens, geese and rabbits. Just like what one sees at a County Fair in Canada. Across from them were farmers on horseback, presumably those engaged in herding livestock for a living. 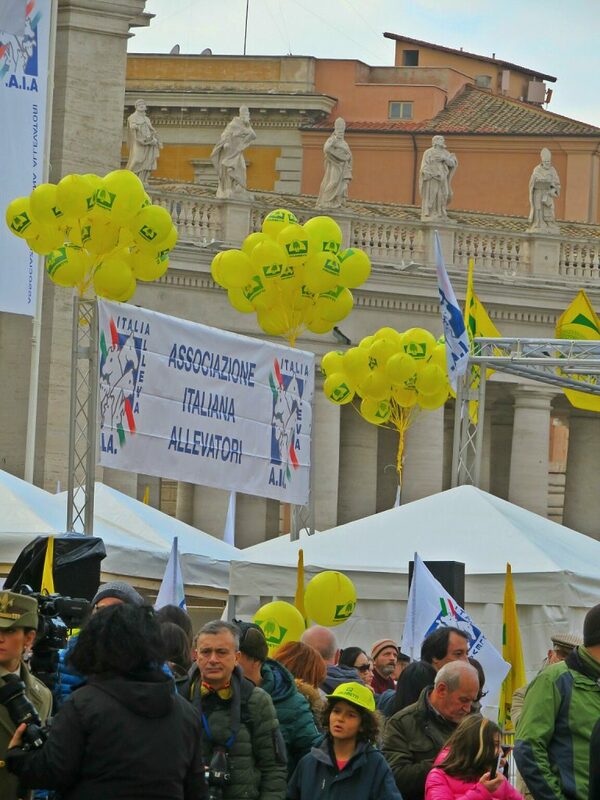 The Farmers Association were giving out yellow balloons and baseball caps. There were also speeches being made but not a huge number of people to listen to them. I wondered what the point of all of this was. 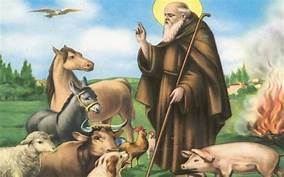 It turned out that today, January 17 is the Feast Day of St. Anthony Abate who is the patron saint of farm and domestic animals, butchers, grave diggers and basketmakers. 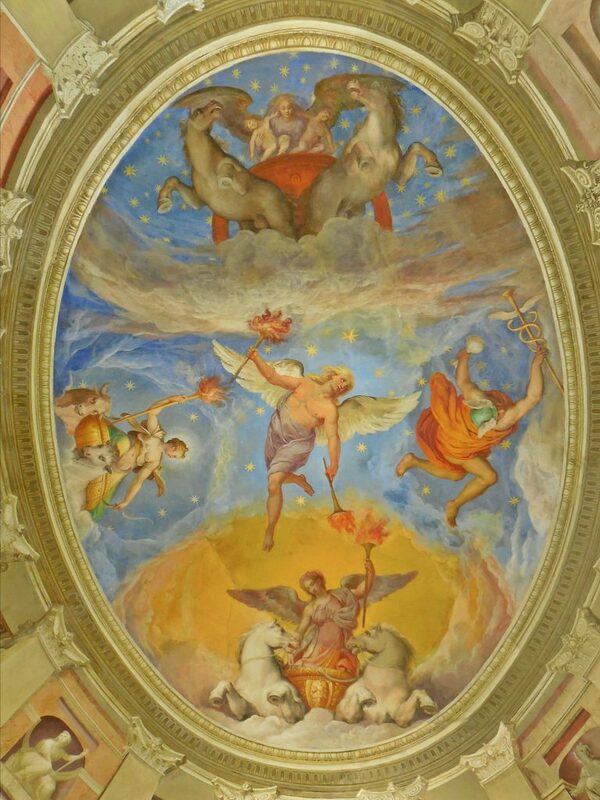 As if this wasn`t a strange enough combination, he also protects against skin diseases especially shingles, known as Fuoco di Sant`Antonio (fire of Saint Anthony) in Italy. The animals are brought to St. Peter`s to be blessed in a symbolic gesture. 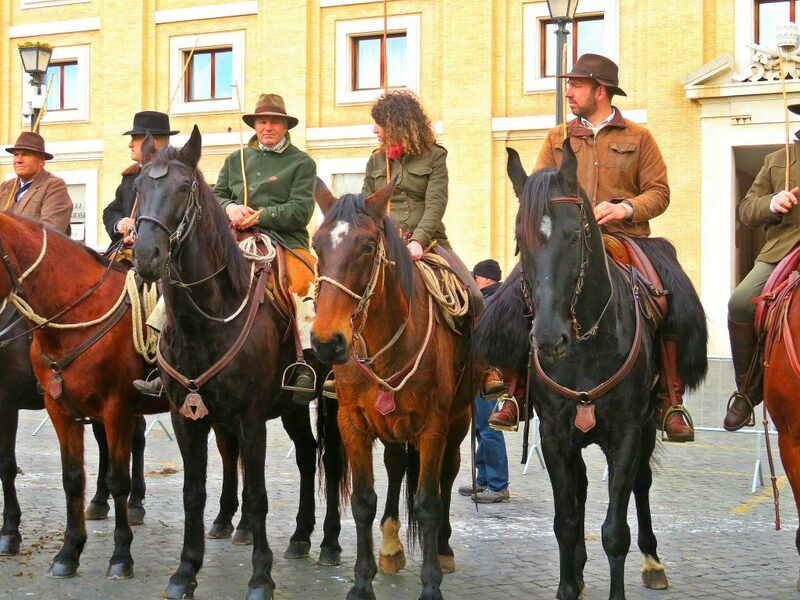 At noon, the Carabinieri Horse Band headed an equine procession down the Via Concessione leading up to the Basilica where it stopped and played a number of tunes. 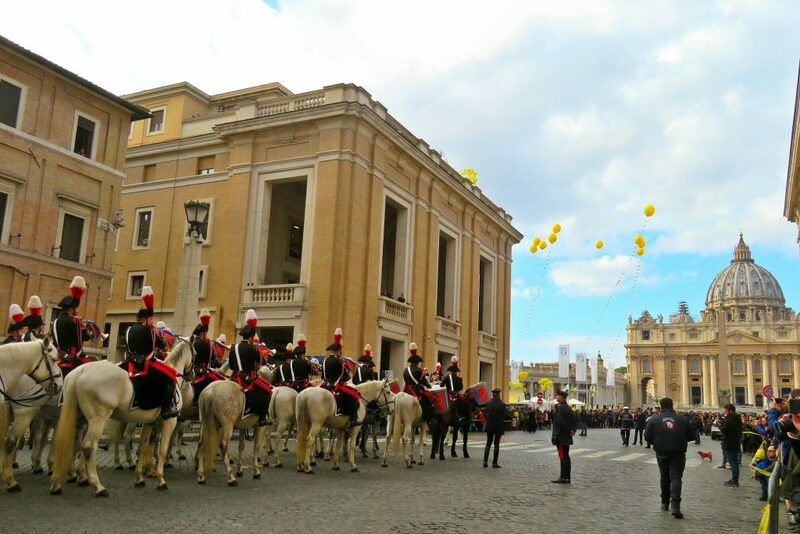 It was all quite unexpected and unusual but it brightened up my day seeing farm animals in the middle of the city and yellow balloons flying in front of the dome of the basilica. Only in Italy would so much money be spent for a blessing. Happy New Year to all my readers. I hope that the new year has started out well for all of you. Many people make New Year`s resolutions and in addition to dieting and stopping drinking for a bit, a couple of my friends have been talking about resolving to use as little plastic as possible. Having grown up in Kenya, during a time where we didn`t have a lot of plastic or things like clingwrap, the habit of re-using and recycling is ingrained. I take my own shopping bags to the grocery stores and I wash out strong plastic bags like ziplock bags, yoghurt containers etc and reuse them. I demand real cups in coffee shops and I rarely use disposable plates or cutlery. However, I’m sure there is room for improvement so I too am going to see how I can cut down. A few days ago, I went to visit my sister in Ajax, a small town close to Toronto on Lake Ontario. 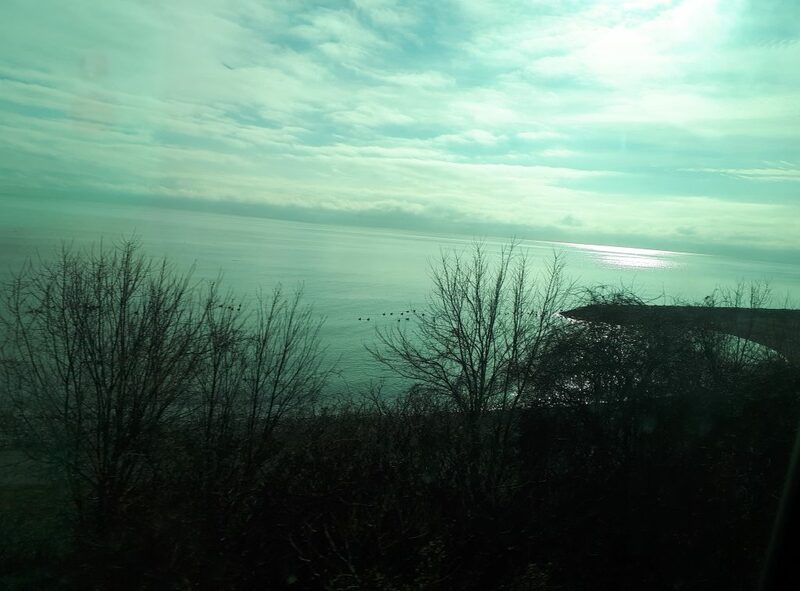 The train goes along the lakeshore and it is a picturesque journey in part. It was the first sunny day practically since I arrived in Toronto and I enjoyed seeing the light on the water. When I got to Ajax, I noticed that people had put out their bins for recycling and organic garbage collection. 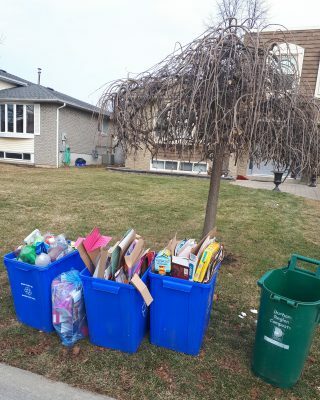 The bins were neatly segregated as instructed and hopefully the contents will be recycled, but I have a sneaking suspicion that a lot of it will end up in landfill. About two thirds of north America`s recyclables used to be bought by China for recycling but it has now stopped accepting various categories and this will likely be treated as garbage. We are producing more garbage than ever before. 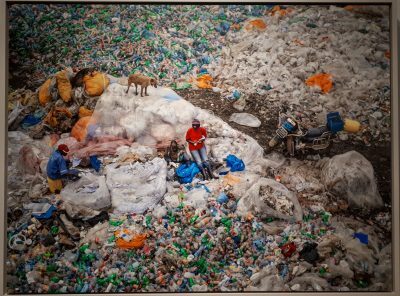 A few days later, I saw an exhibition entitled `Anthropocene` by Edward Burtynsky, Jennifer Baichwal and Nicholas de Pencier at the Art Gallery of Ontario. The word Anthropocene signifies our current geological period in which humans are the primary cause of permanent planetary change. Burtynsky is noted for his documentaries and spectacular photographs which look like amazing landscapes from afar but when you look closely, you see that in fact it is a destruction of the landscape caused by human activity such as mining and manufacturing. 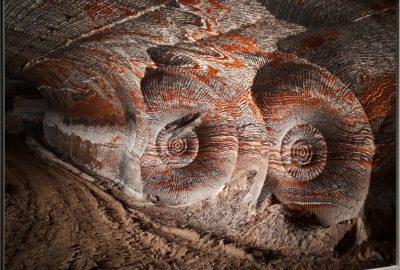 The picture above shows a Potash Mine in Russia where machines tunnel underground leaving impressions that look like sea fossils, beautiful to look at but the damage underground is extensive. The exhibition highlighted the extreme changes that we humans have caused to the landscape, for example destruction of vast tracts of forest in order to raise cattle or cash crops and fracking for oil. I was particularly saddened by a pictures of a garbage dump in Dandora, Nairobi. It didn`t exist when we lived there but now covers 30 acres. It was declared full in 2001 yet the site is still active and locals sort scrap by hand to sell it to recycling plants. The amount of plastic is horrifying. Plastic does not degrade and is piling up all over the world. There is an area reputed to be 1.6 million square km in the Pacific Ocean called the Great Pacific Garbage Patch in which there are high quantities of plastic, 100kg per square km in the centre. There is also a North Atlantic Garbage patch. The UN Ocean Conference in 2017 estimated that there will be more plastic in the ocean than fish by 2050. On that note dear readers, please try and cut down on your use of plastic and tell your friends. If anyone has tips for cutting down on plastic and reducing garbage, add them to the comments section so we can all benefit. Like everywhere else, pre-Christmas shopping and socializing are in full swing here. The streets are crowded with shoppers and there are little Christmas markets selling crafts and food. 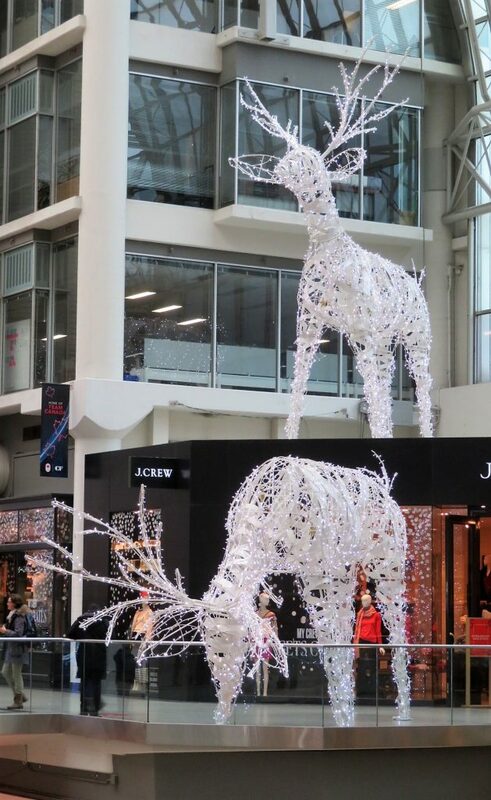 I wondered where this custom of gift-giving had arisen and lo and behold, I found out that it has existed here since Roman times when the pagan festival Saturnalia was held to celebrate the winter solstice. According to the calendar of that time, the day of the solstice was December 25th and was marked by feasting, partying and the exchange of small gifts. In the 4th century, Pope Julius declared this day to be the birth day of Christ in the hope that more pagans would convert to Christianity. The custom of lighting candles signified light returning after the solstice and of course, lights are now a big part of Christmas. The streets here are all lit up and very festive looking. 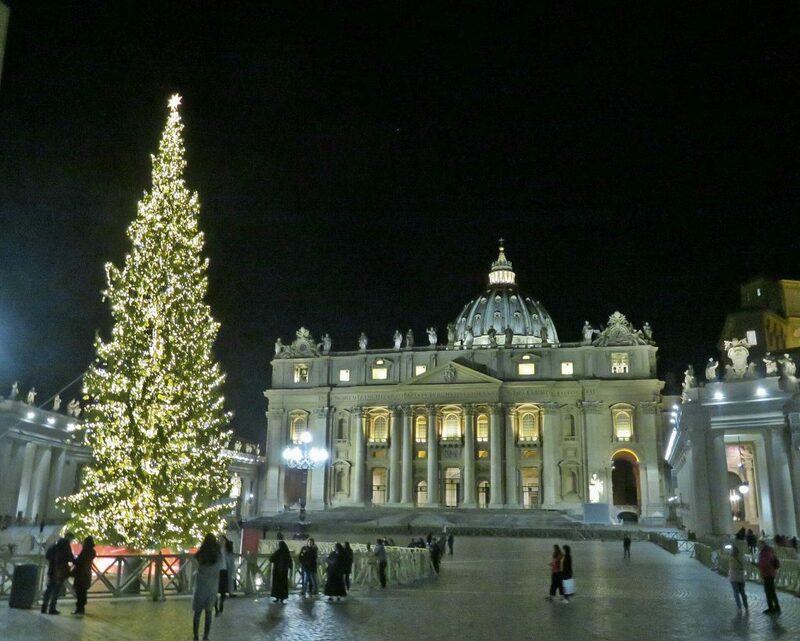 As usual, there is a very large tree in the Piazza of St. Peters Basilica. Every year a particular town or region constructs a huge Nativity scene in the Piazza and this year Venice created it out of sand taken from the Lido di Jesolo. Good thing it`s covered as we`ve been having more rain than usual. The custom here is to place the baby Jesus in the crib on Christmas Eve after midnight Mass. Obviously, this could not be done with the sand sculpture so it is already complete. 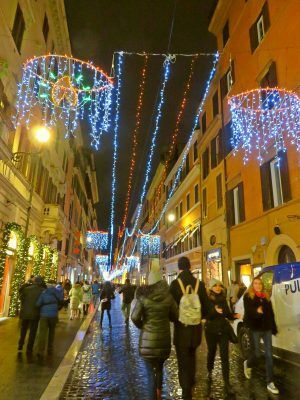 Last year, the Christmas tree which the city installs in Piazza Venezia, was a laughing stock as it was spindly and dying when it was put up earning the name of Spelacchio, the mangy one. This year, Netflix has donated a tree and a fine one it is too. In fact so large, that the bottom branches had to be sawn off in order for it to be transported to its location and then hammered back into place again. The only eyesore is that there is a large TV screen at the bottom presumably showing something related to Netflix. I didn’t get close enough to see as it was raining when I went by. During Roman times when Saturnalia was celebrated, schools and workplaces were closed and even the slaves didn’t work during this time. I met a friend today who has turned down a dinner invitation on Christmas Eve as apparently, all public transport will stop at 9 pm, taxis will be scarce and he won’t be able to get home. Romans still take their holidays seriously it seems. 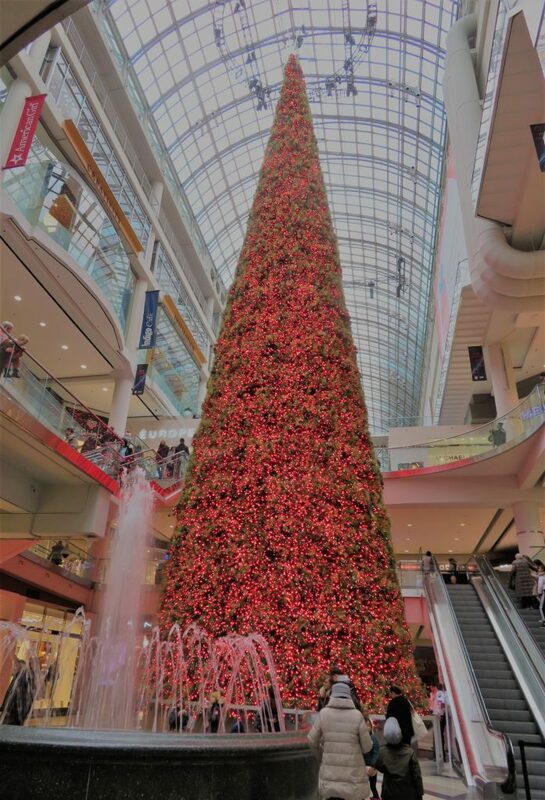 I myself will be back in Toronto for Christmas and for sure public transport will be operating normally there. The last time I was in Dublin about three years ago, I didn’t notice the above spire. I’m not sure why as it is 120 metres tall and soars into the sky; one can just barely see the top. It stands opposite the General Post Office (GPO) on O’Connell St. where I went to see a relatively recent permanent exhibition on the Easter Uprising in 1916. Since the GPO was the centre of the uprising, it made it more real being within the building where the battle started and a perfect location for the exhibit. 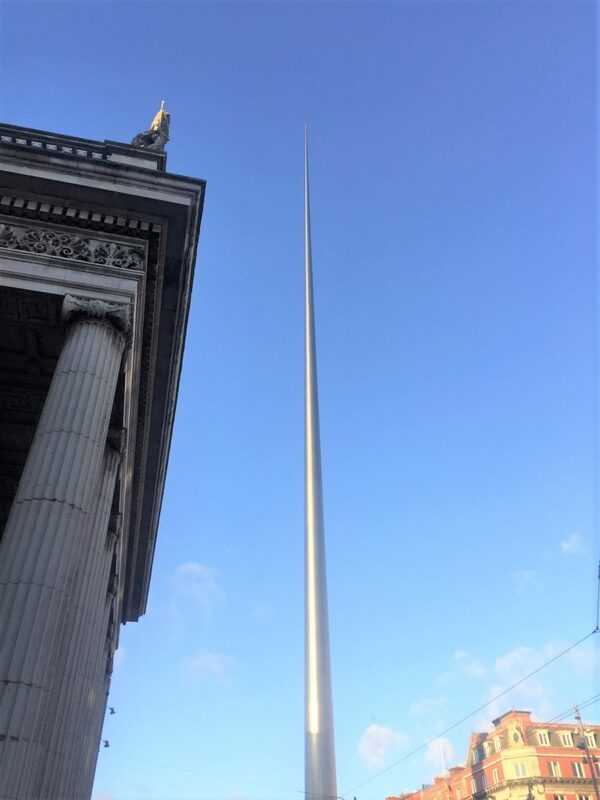 Somehow, seeing the spire just outside seemed a fitting symbol of a nation rising against oppression. It stands on the site where Nelsons column once stood and was blown up by the IRA in 1966. 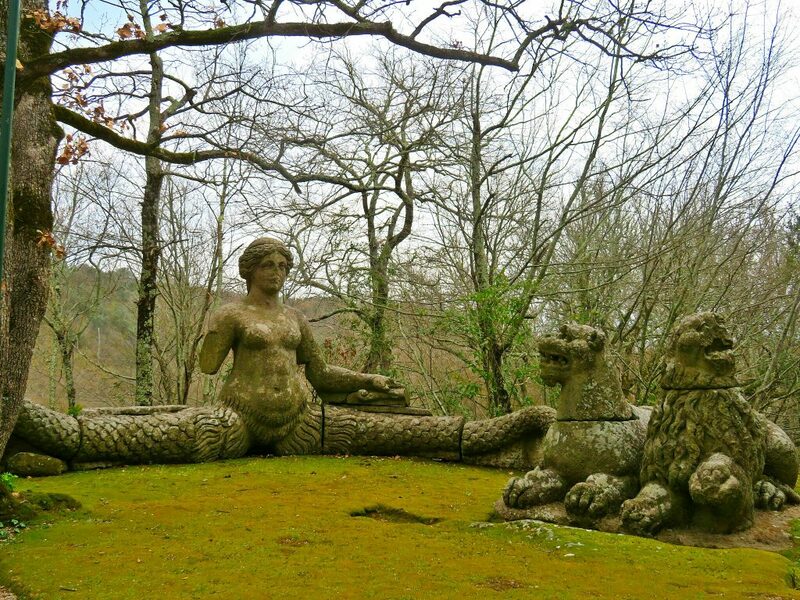 After that, a reclining statue of Anna Livia sitting on a slope, with water flowing past her to represent the River Liffey, was installed which Dubliners quickly referred to asThe Floozie in the Jacuzzi. 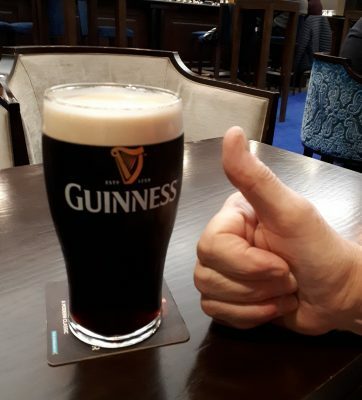 I didn’t spend a lot of time sightseeing during my week there as my main goal was to catch up with as many friends as possible both in Belfast as well as in Dublin so I spent most of my time eating and drinking, Guinness of course! I lived in Dublin for many years but the city has changed considerably since I lived there. One expects to see restorations and new buildings but I was taken aback and charmed by this building which I came across by accident and which I had never noticed before although it was certainly there during my time. It’s the building occupied by the oldest charity in the city of Dublin who used it from 1855 to 1992. As you can see from the writing across the front, the charity is the Sick and Indigent Roomkeepers Society established in 1790 to relieve the poverty which pervaded the city at that time. Unable to work and ashamed to beg, many people died from poverty in garrets and cellars. It was to help these people living in a particular part of the city, that the society was formed. The charity still exists and helps people who are experiencing temporary difficulties and need one time assistance to get back on their feet. I love the name of the Society. Dublin was very festive coming up to Christmas with streets and shop windows beautifully decorated, much more so than Rome. However, today is the Feast of the Immaculate Conception and marks the start of the Christmas season here. 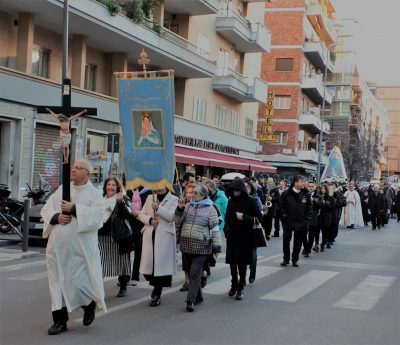 It happens to be the feast day of the neighbourhood I live in and there was the annual procession on our hill. I went to catch a bus at the bottom of the hill this afternoon and bumped into it as it came along the main road for a short stretch before going back up the hill again. People wait until today to put out their decorations and the Christmas lights in the streets will be turned on tonight. The shopping has already begun.